I grew up in New Hampshire. Solidly in Dunkin' Donuts territory, where I ate my share of mediocre donuts (but liked the muffins), and was introduced to coffee more as a way to order your cream and sugar, not the other way around. I drank way too many iced coffees loaded with sweetener and cream even in the winter, and adored Coolattas in the summer. And then I moved away, didn't have it for years, and had my memories shattered when I tried the baked goods, and the coffee, as an adult more recently. I knew that Canada (and other countries), had a very similar looking chain: Tim Hortons. I think it may have even existed in rest stops in upstate New York, where I went to college. But I never tried it. Until my recent trip to Canada. Every morning, I saw the queues of people at every Tim Hortons, on every corner, in every food court. I was amazed at just how popular it seemed. Even Dunks and Starbucks don't get crowds like that. Eventually, curiosity got the best of me, but not until I was in the Toronto airport, and a bit bored waiting for my flight. I don't actually know much about Tim Hortons, except that it really was founded by a Canadian hockey player named Tim Horton, and is a huge franchise now with stores in a slew of countries. The menu seems far more extensive than Dunkin' Donuts, going far beyond donuts, coffee, basic baked goods (muffins, croissants, bagels, etc), breakfast sandwiches, and wraps, which Dunks' has also tried to expand into, to hot bowls like mac and cheese or chili, specialty hoagies, and even milkshakes. I tried the donuts. They were ... um ... chain donuts? 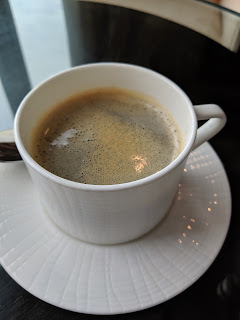 I'm not sure what people love though, and didn't get a chance to try the coffee, so it is possible that I just didn't go for the right things. "We freshly bake our donuts in small batches throughout the day in our Restaurants. Our bakers hand-dip, glaze and sprinkle each donut with care." 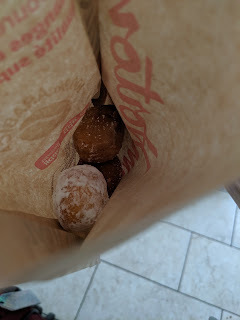 Tim Hortons says they bake the donuts on site at every store still, which is clearly different from Dunks, where the donuts are now baked off in larger distribution centers, and delivery daily (or are they frozen at this point?). I think Tim Hortons does parbake though, but at least they are finished on site. 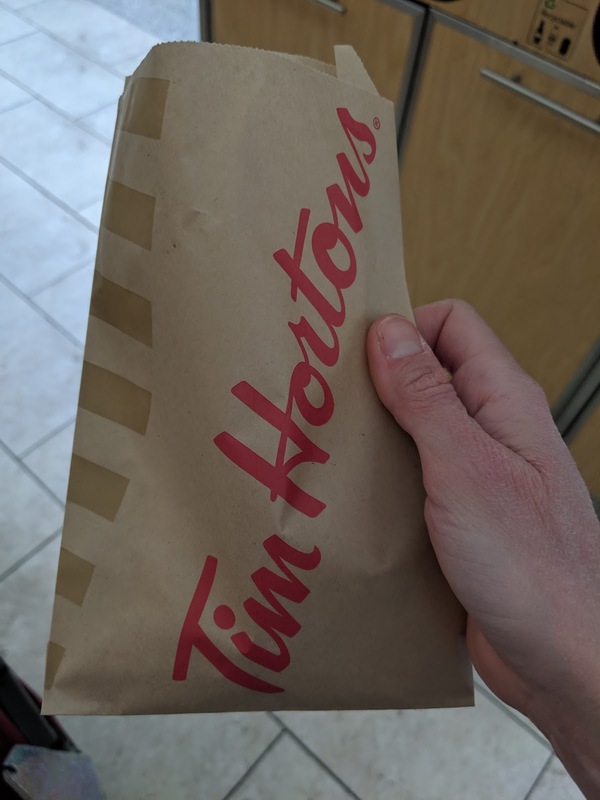 Being a donut-lover, I decided to focus my first Tim Hortons experience here. I probably looked kinda silly, so gleeful to get my bag of goodies, but ... this was a first for me! As my introduction to Tim Hortons, I wanted to try several kinds, and thus went for Timbits, their version of Munchkins, or, you know, donut holes. "You love ‘em, we love ‘em, everybody loves ‘em. 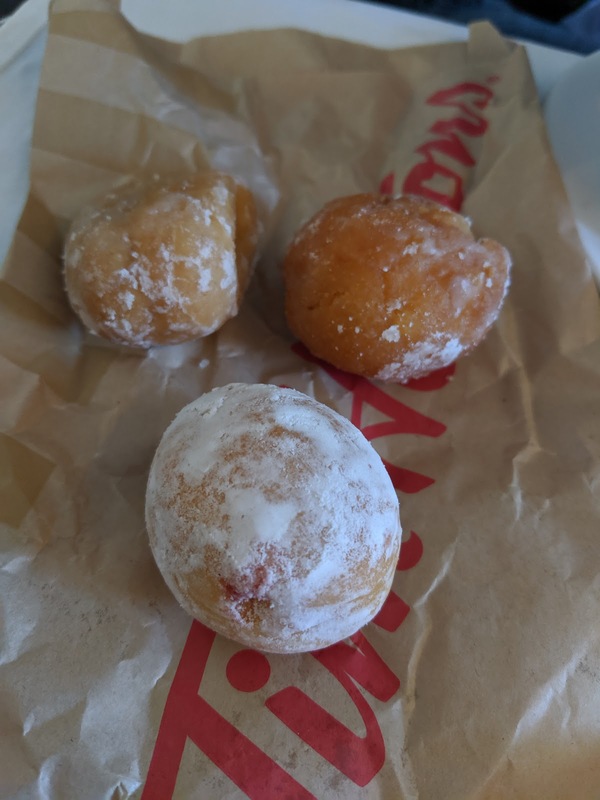 Bite-sized morsels of our traditional donuts, Timbits® are available all day long in various Snack Pack sizes. Perfect for parties, meetings or any time. Selection may vary by restaurant." I give Tim Hortons credit for the extensive lineup of Timbits. I think the shop I was at, the airport location of all places, had at least ... 10 kinds? 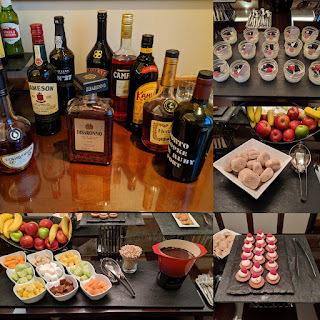 I was thrilled to have such variety to pick from, cake or raised style, ranging from plain old fashioned, to glazed old fashioned, to honey dipped, maple dipped, cinnamon sugar coated, chocolate glazed, birthday sprinkle coated ... the list went on and on. I selected three, but only really liked one. Apple Fritter, Sour Cream Glazed, Powdered Sugar Jelly Filled. I selected my top 3: apple fritter (!!! woah, as a mini?! ), sour cream glaze (one people seem to love), and a powdered sugar one I hoped would be filled (it was, with jelly), although the birthday sprinkle one was close behind. I adore apple fritters, I commonly call them the "Kind of Donuts" and have deemed them nearly impossible to mess up. I have never, ever seen them donut hole size though, rarely even *normal* donut size, as they are usually giant. I was so excited for this one. Not so great. Not even good, really. It also lacked the aspect that makes fritters amazing: the crispy, super fried, exterior with crags and glaze hanging off. It did have glaze, but it was soft, and ... just glaze. So for my first Tim Hortons donut, this was beyond a letdown. My least favorite of the trio I tried. Next I went for Sour Cream Glazed, a cake style donut. Perhaps I should have gone for the plain ro glazed old fashioned but ... the sour cream glaze sounded so much more interesting. And, it was. I liked this donut, a cake donut of all things. Fairly light for a cake donut, and I really did enjoy the sour cream tang to the glaze. This one I quickly finished, no problem. My favorite, and the only one I'd get again. Powdered Sugar Jelly Filled (Raised). And finally, a filled donut, covered in powdered sugar, raised style. They make this is lemon, raspberry, and strawberry, and the donuts were not labelled at the shop, so I'm not certain which this was. Clearly, not lemon, but I couldn't tell between strawberry or raspberry. Another general favorite of mine, but the jelly filling in this was beyond disappointing. It only had a tiny, tiny drop of jelly, hence why I never figured out what kind it was. Hopefully the full size donuts are more generously stuffed! The donut itself was just boring, standard kinda stale tasting raised donut, slight extra sweetness from the powdered sugar. I wouldn't get this again, clearly. 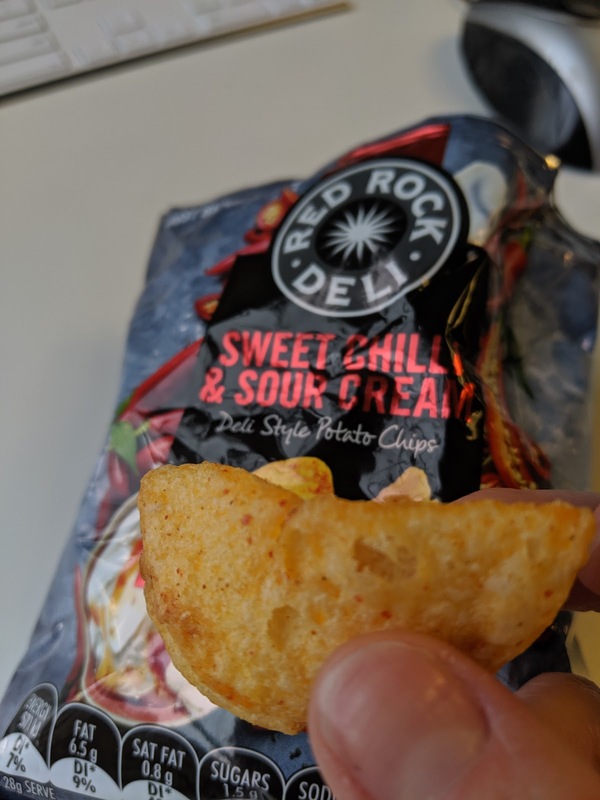 Red Rock Deli is a brand of snack foods in Australia, stocked at my office in Sydney. Over the years, I've had a opportunity to try a number of their chips, but they also make a flavored popcorn lineup that looks amazing, and a line of flavor coated peanuts. Bold, unique flavors seems to be what they are all about. For the chips, all have the same kettle chip base, crispy, fine for kettle chips, but aren't really my style. I keep trying them though because the flavors are fascinating. I've only tried the standard chips, but they also make "Special Reserve" line with flavors like Slow Roasted Pork Belly & Mustard Cider Jus (yes, really). Sweet Chili & Sour Cream. "The lingering sweet heat of chilli and paprika with a hint of smooth, tangy sour cream." The first flavor I tried was the Sweet Chili & Sour Cream, because I was so excited to see that they turned my favorite Sydney pub snack (wedges with sweet chili & sour cream) into a chip. As I said in my intro, the chips were fine, crispy style, but not really what I'm into these days, but I tried these to see how the flavor was. 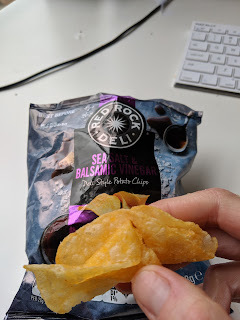 They really kinda did taste like sweet chili & sour cream, or perhaps something like a bbq chip crossed with a sour cream & onion with less onion focus. 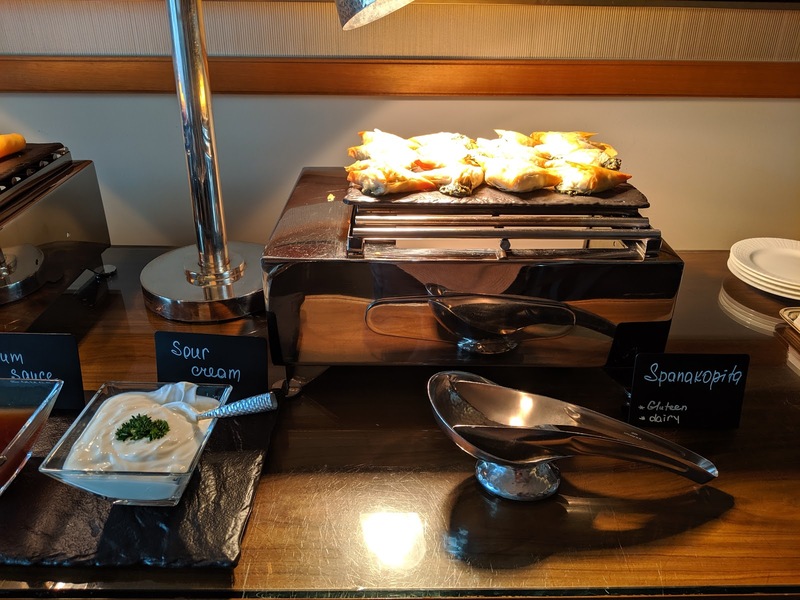 I liked the flavor, but it was nothing like dipping a wedge, or even a plain chip, into a generous glob of sweet chili and sour cream. Interesting to try, but not something I wanted more of. Sea Salt & Balsamic Vinegar . "A grind of fresh sea salt with a generous splash of the sweet sharpness of balsamic vinegar." Next I tried sea salt & balsamic vinegar. They were interesting. At first, they tasted just like salt and vinegar chips, something very familiar. Strong vinegar component. And then, there was ... yup, a hint of balsamic. I call these ... "Elevated Salt & Vinegar", the flavor really is more unique, but very much the same as a classic salt and vinegar at the same time. Again though, for me, interesting to try, but not what I wanted as I'm just not that into potato chips these days. "The sweetness of honey cut by the subtle richness of soy sauce." And finally, Honey Soy Chicken, the ones I expected to like the least, as I don't care for chicken. But ... I think I liked them the best? Maybe I was just more in the mood for chips that day? I actually liked the crispy, very fried, form factor of the chips. And then the flavor. Um, yeah, they "tasted like chicken". But, zesty chicken. BBQ chicken. Or I suppose, honey soy chicken? 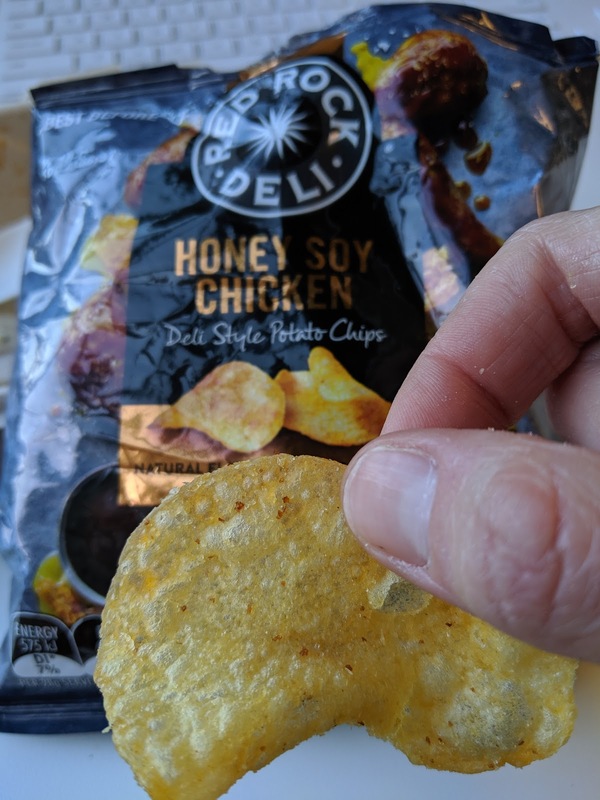 So very odd, but I didn't dislike them, although my American chip brain still doesn't quite know how to deal with meat flavors in my chips. I adore soft serve ice cream. 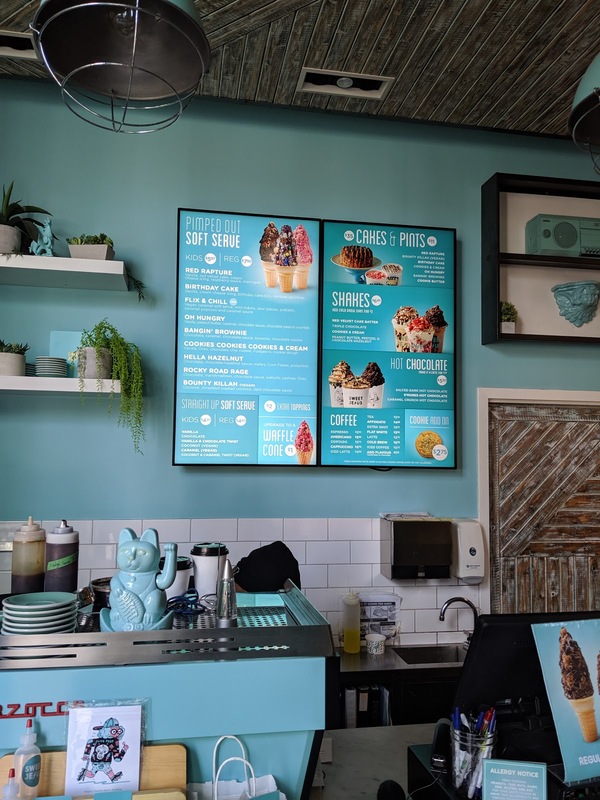 I grew up in the land of soft serve cones in the summer, and I just don't understand why San Francisco does not really have this. I miss it. There is nothing like licking even a simple vanilla soft serve cone, with rainbow sprinkles, in the sun. "Sweet Jesus was born out of a love for experimentation. 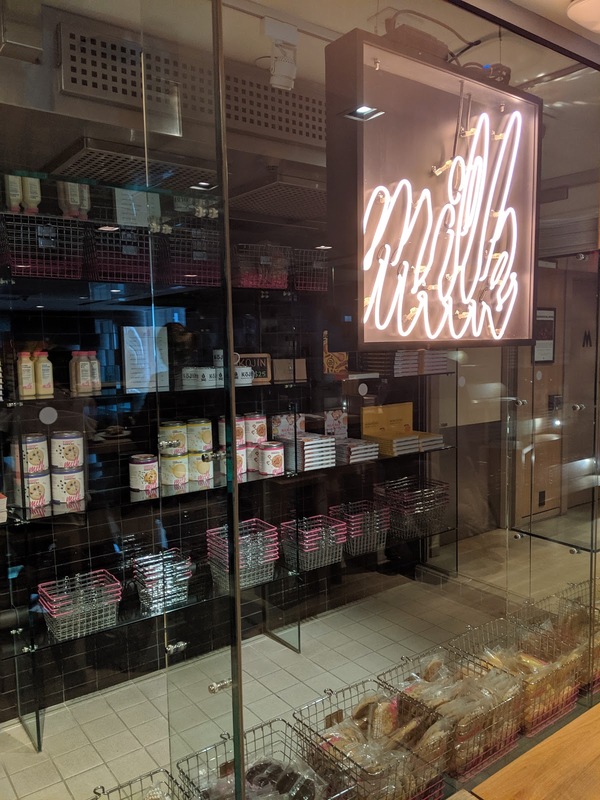 As leaders in the confectionery game, the goal is to combine conceptual thinking with high-quality ingredients and products, in an effort to make something that tastes and looks, unlike anything you’ve ever seen and had before. Toronto born and globally grown; Sweet Jesus is the little ice cream shop that wouldn't quit. " 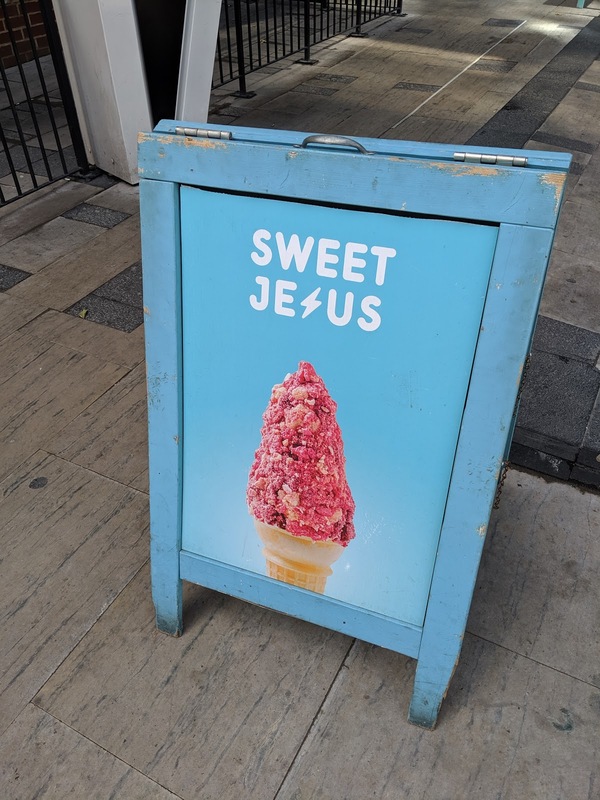 Sweet Jesus is a moderate size chain with locations in Canada, 2 of which were within a 5 minute walk of my hotel or office in Toronto. I visited my first, and last, days, even though it was *not* ice cream weather. 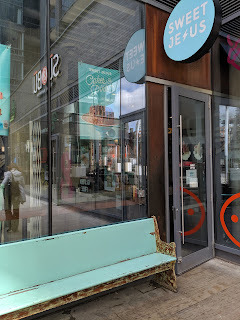 I had a mixed experience at Sweet Jesus. The staff ... certainly not the best. They clearly were bored with their jobs, didn't really like customers or talking to people, and generally would prefer if no one entered the shop. But they did their jobs. The ice cream was fabulous, exactly the kind of soft serve I love. The creations? A mixed bag, one I adored, one I really disliked. Still, I'd go back. I just wish they had more flavors (only vanilla or chocolate base), or custom options. You can tell that Sweet Jesus doesn't offer "average" ice cream, the moment you see the signs out front. 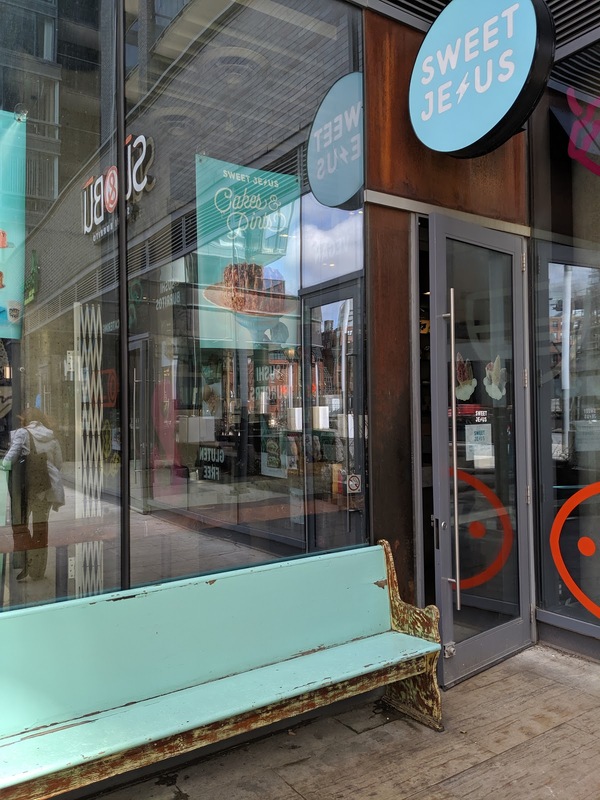 The storefront is otherwise nondescript, with a turquoise bench out front, which turns out to be the only seating, and a color I'd see a lot of. The shop I visited is tiny, basically just an ordering counter, space for 1 staff member to move around, and little else. Not really any seating, which is a bit unfortunate in the winter when I visited. They do still try to make it attractive, with plants, and everything following the turquoise color scheme, including the straws and spoons. The main attraction at Sweet Jesus is the "Pimped Out Soft Serve", ridiculously designed ice cream creations, using vanilla or chocolate soft serve, or vegan coconut soft serve, as the base with some very, very interesting toppings, 4-6 on each one. The menu is rounded out with some equally elaborate hot chocolate (something to keep them in business in the winter? ), coffee drinks, shakes, and packaged cookies made by another vendor. 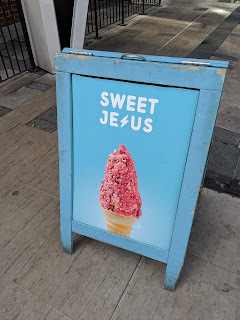 Sweet Jesus is ... an opinionated ice cream shop. You cannot create your own. You can opt for one of their pre-designed creations, or you can get it plain. Two sizes available, "Kids" or "Regular", cake cone, sugar cone, or dish (or upgrade to waffle cone), and that is it. 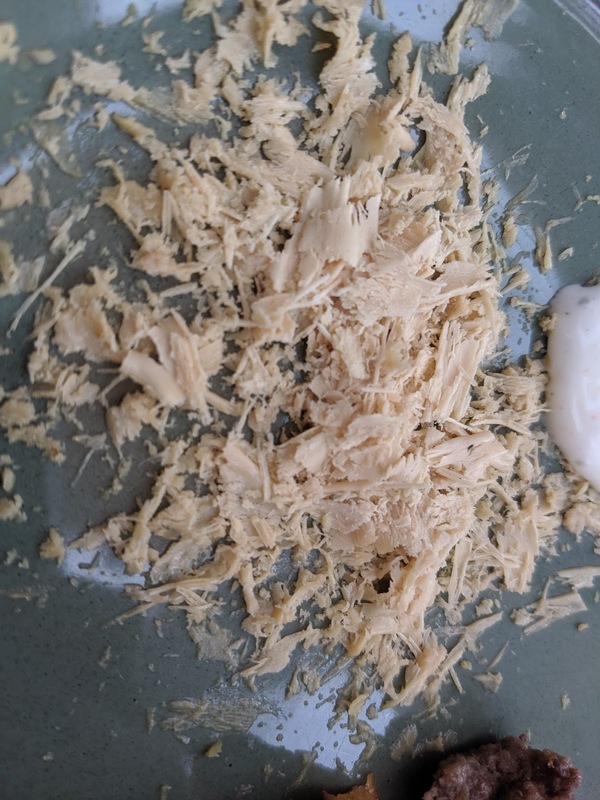 I sampled the vegan coconut ice cream out of curiosity, but I'm glad I didn't order it, it was far too ... coconuty for me. The regular ice cream however, both the vanilla and chocolate, were quite good, very creamy, just, great soft serve. 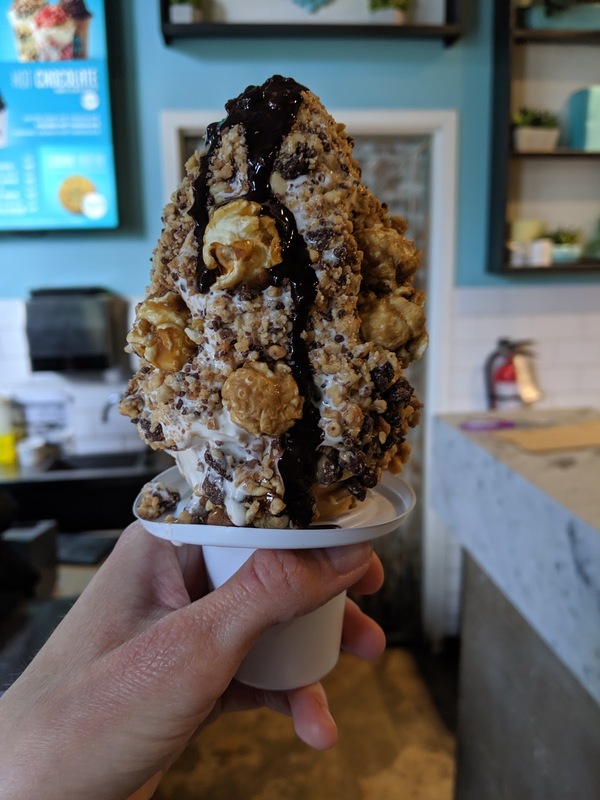 "Vanilla soft serve, peanut butter sauce, caramel sauce, chocolate peanut crumble, chocolate sauce." My first visit I went for my top choice, no question. The O'Hungry. It used vanilla ice cream as the base, and it was perfectly creamy, just plain vanilla, sorta like McDonald's soft serve vanilla, but I mean that in a good way. It melted nicely, it was creamy, but it really was there just to be a base anyway. A base for ... such incredible toppings. Yes, I know this looked ridiculous (as did I attempting to eat it, I'm sure), but it tasted amazing. And yes, it was a bit difficult to eat. My addition of the caramel corn certainly didn't help matters! The peanut butter sauce, caramel sauce, and chocolate sauce were exactly what you'd imagine. Perfect combo of sweet, chocolatey, and peanut buttery. 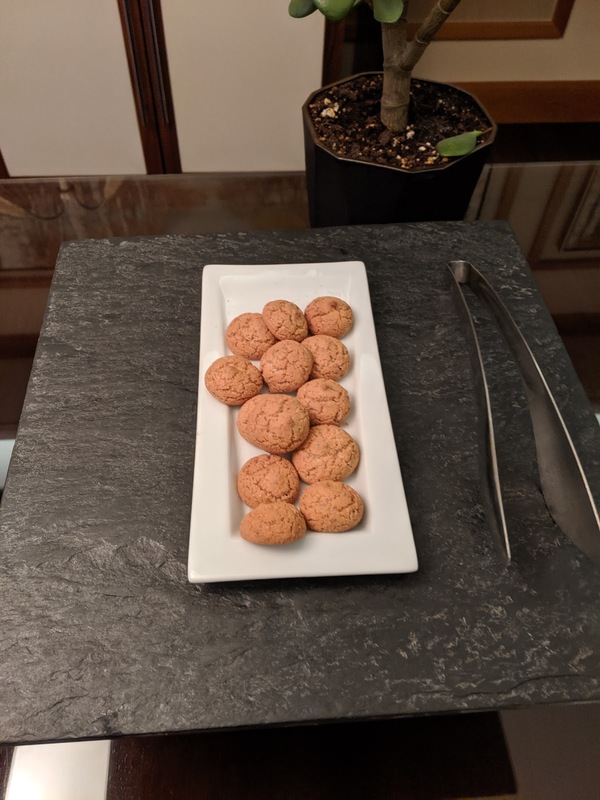 They dripped all over, and infused every bite, in great combination. I loved the sauces on here. And but before the sauces were added, the whole thing was rolled in chocolate peanut crumble, and that was amazing. It added texture, crunch, and, well, tons more chocolate and peanut flavors. My caramel corn was entirely unnecessary, but I still welcomed it, and I'm glad they let me add it, even though its against their policies. I normally don't eat ice cream cones (they just taste like Styrofoam, are often stale, etc), but I love licking cones, so I always get them, but this was an exception. The cone was actually tasty, more like a wafer cookie than dry stale standard cone. I surprised myself by eating it all. I enjoyed every last messy bit of this. I really appreciate the catcher around the cone, so all the bits that fell off weren't wasted. So much love for this cone. I'd get another in an instant. Birthday Cake. Kid's Size. Cone. Sub Vanilla/Chocolate Twist. 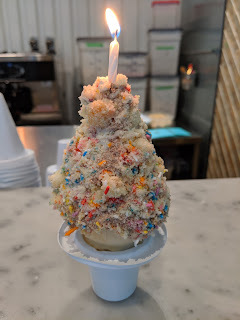 "Vanilla soft serve, cream cheese icing, birthday cake bits, rainbow sprinkles." 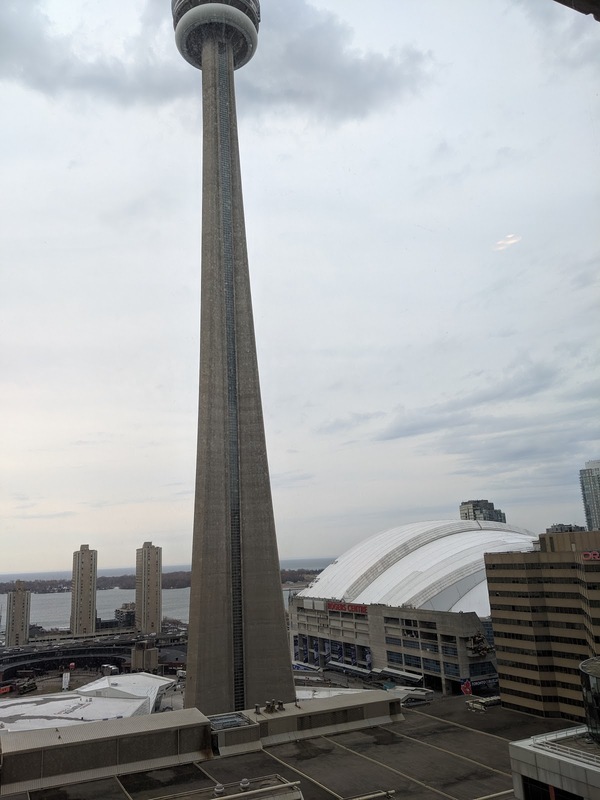 So I returned my last day in Toronto, when the temperature went back above freezing (I'm not joking, it got so cold!). This time I opted for an even more ridiculous looking one: Birthday Cake. I was fascinated by the thought of cream cheese icing on a ice cream cone, and I just love rainbow sprinkles. 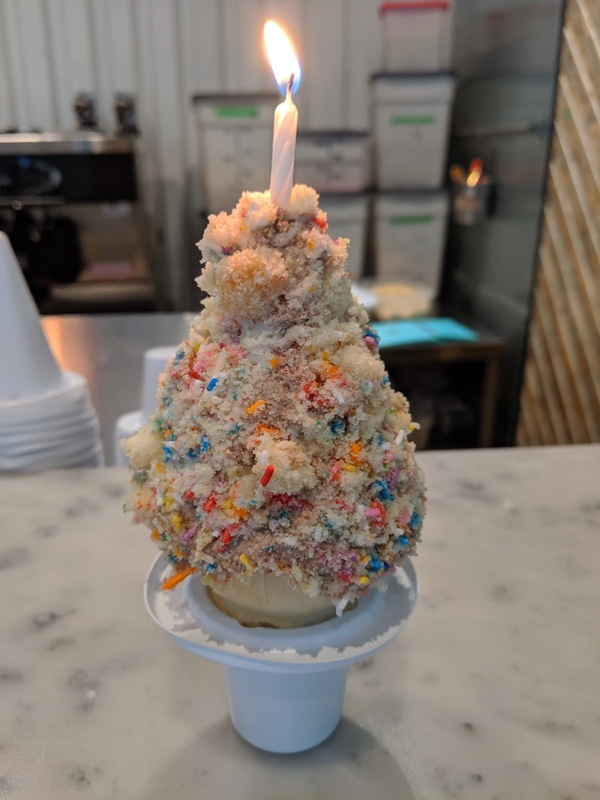 I did NOT realize it would actually come with a birthday candle, lit, on top! I turned around to pick up my ice cream and was quite surprised. The staff are clearly bored with people's reaction to this though. I blew out the random candle, threw it out, and felt wasteful. But I'll admit, it was a little fun. For this one, I actually had them use the chocolate and vanilla swirl, after sampling the chocolate and liking it quite a bit. Again, the ice cream was really wonderful, both flavors the perfect texture, so creamy, and the chocolate a mild chocolate in a nice way. Wonderful base. But then ... my toppings. The O'Hungry was a huge success on the topping front, but this was not. I never found any cream cheese icing. I'm not sure where it was. What I did find was a ton of the birthday cake bits. Why I thought I'd like this is a mystery to me, really. They were ... just chunks, in various sizes of stale dry birthday cake. I hated the texture. I hated the dryness. I hated it. The sprinkles (and likely the cream cheese icing?) were lost in it. I knocked off all the big chunks, and pulled out my emergency backup toppings (sprinkles, heath bar bits, chocolate chips), which of course I had in my bag. I still loved the ice cream, but sadly, the toppings on this was just not winners. The cone also tasted kinda stale. 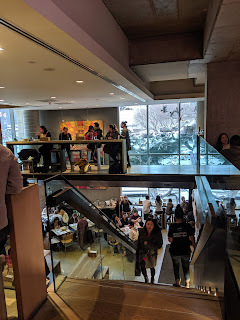 Blah, blah, blah, Momofuku. Yes, it is a worldwide empire, and yes, even though I had a lackluster meal at Noodle Bar in NYC, and even though reviews are pretty negative and sounded nearly identical to that of Momofuku Nishi (where I actually had decent meal the year before), I still gave another Momofuku establishment a try. This time, in Toronto, at Momofuku Kōjin, only open a few months. The focus at Kōjin is the hearth, a wood fire that many of the elements are cooked on. The exec chef is Columbian, so there is some inspiration from her background, combined with a focus on local Canadian ingredients. 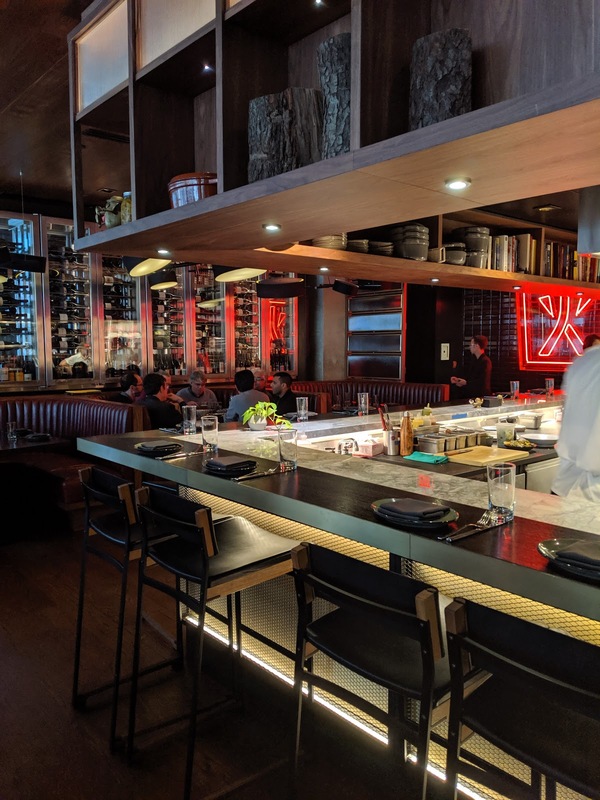 Like most Momofuku establishments, there are a couple signature items at Kōjin, and everything else tends to get lackluster reviews, very hit or miss. We ordered way too much, encouraged by our server who even with our order told us we weren't ordering enough. Sigh. 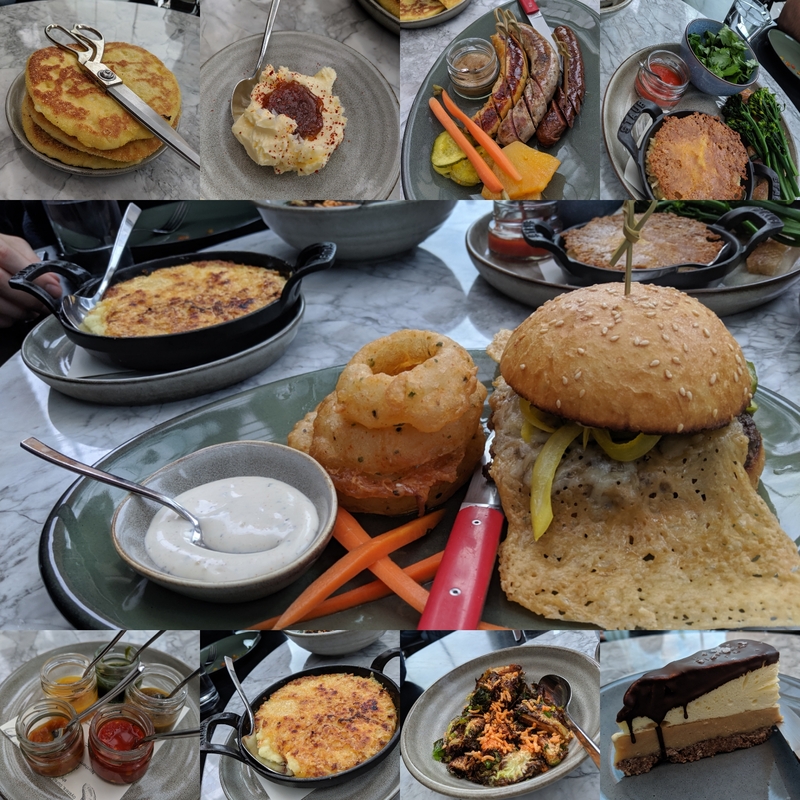 It was very much NOT a light meal, and we didn't even have room for real dessert. Even me, the girl who *always* has room for dessert! I was shocked by how heavy every dish was. Our experience was fine. Everyone liked a few dishes, and we were indifferent to many. Most everything was good enough, but fairly forgettable. Like most Momofuku establishments, the strong points for me were the sauces. The Momofuku complex in Toronto is attached to the Shangri-La hotel, and ... well, it is a complex. No other way to describe it. 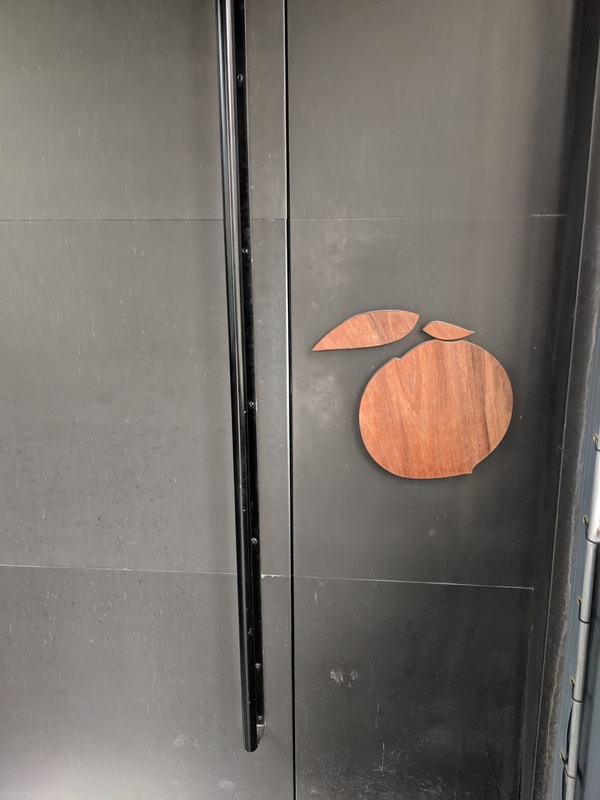 You know you have found it when you see the signature peach sign. 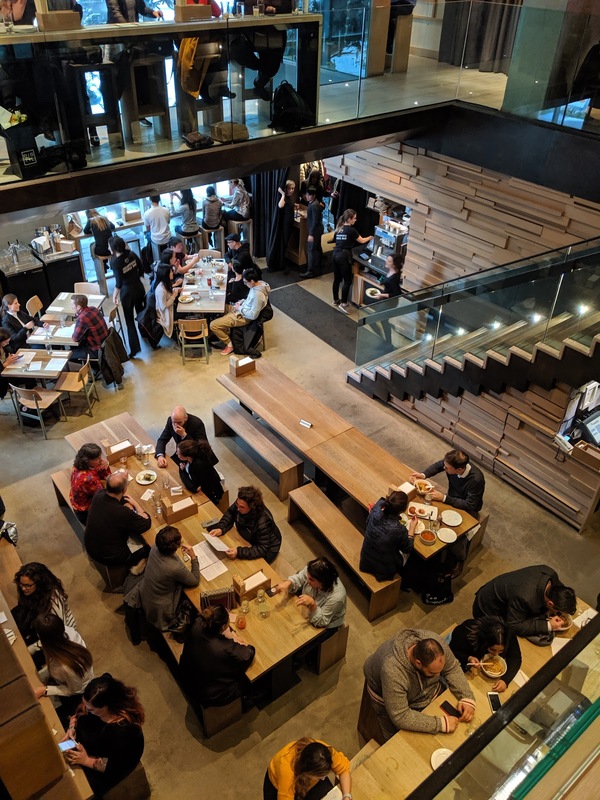 The ground floor, a large expansive open space, houses a Momofuku Noodle Bar outpost, with huge communal tables, and some bar seating. Second Floor: More Noodle Bar. 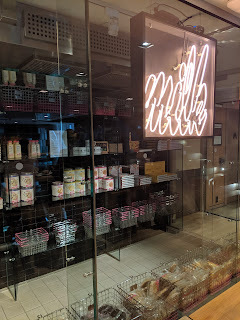 The tiny little outpost of Milk. Sadly it isn't really a staffed bakery, just a little room with the signature cookies, truffles, and crack pie. I think you select items to bring down to the cashier at Noodle Bar? We skipped this, as my love for the cookies has mostly worn off, and they don't sell the epic cakes there. 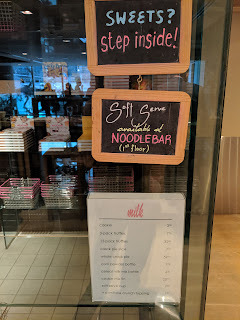 At least they do offer the famous soft serve, but only down in Noodle Bar, and the flavors were cereal milk or hot chocolate, with only cornflakes as a topping. I was heartbroken, as I planned to purchase rainbow sprinkles to bring home with me! 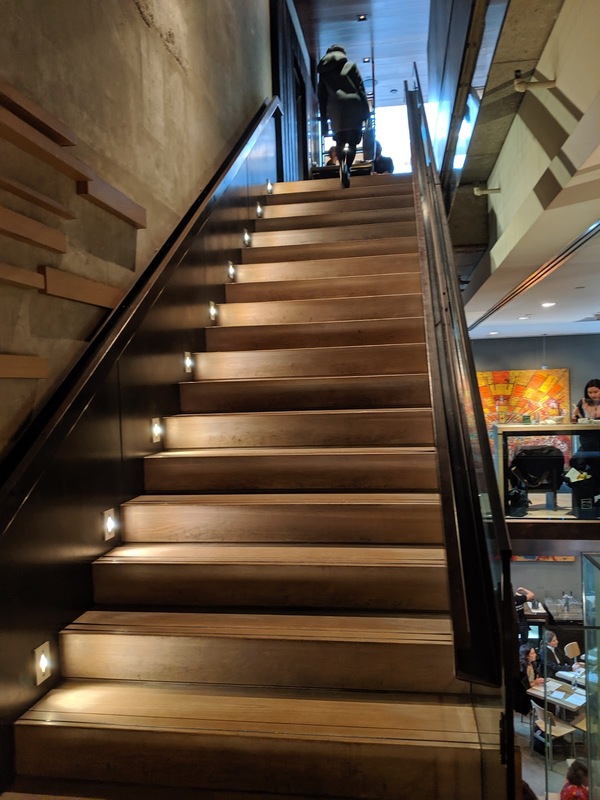 Once you walk through both floors of Noodle Bar, and past Milk, you finally reach the staircase up to Kōjin. There is a chef's counter overlooking the open kitchen. 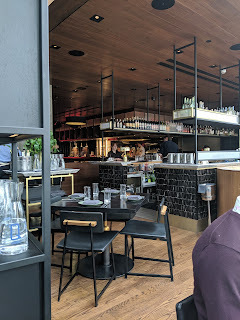 A bar is adjacent to the chef's counter, also with seating along the bar, and tables fill the rest of the space. Inside is spacious, with crazy high ceilings, floor to ceiling windows, and tons of glass and natural light (at least, until it got dark). 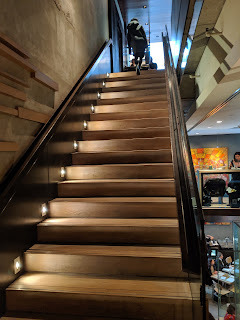 Decor is hard wood, the floors, the tables, the ceilings, and dark materials, but overall it isn't a dark vibe, given the amount of light and openness. 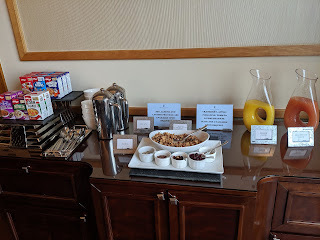 Our large 6 person round table came with a lazy susan, which turned out to be really convenient for passing the food around, as everything is share style. Music was a bit too loud. Service was a mixed bag. Some staff were attentive, well trained, conversational, not invasive, etc. Others seemed a bit like robots, uninterested in what they were saying, let alone what you had to say. 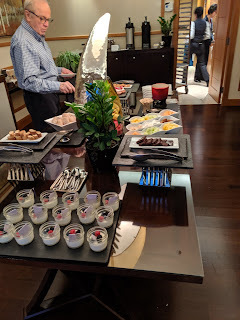 The pacing was good, we were warned that some items, like the 1/2 roast duck and steaks, would take a while, but they coursed everything appropriately. 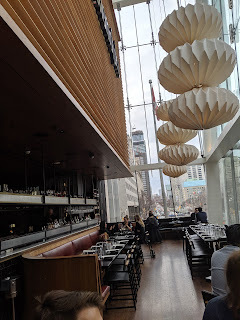 When I made our reservation, I was fully intending to get a cocktail, as the cocktail menu looked fabulous, but this was my last big group meal in Toronto, and after a week of cocktails ... I was ready for a glass of wine. I was sad, but honestly, it is what I wanted. Grenache Fredic Brouca 'Champs Pentus', Faugeres, France '17. $17. 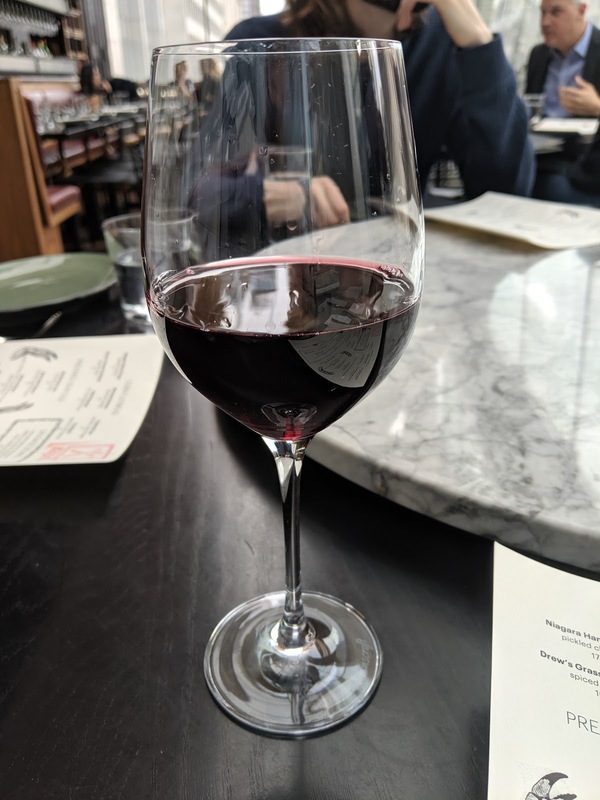 I asked for a recommendation for a red wine that wasn't too tanic, but also not too light. 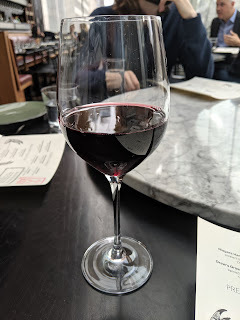 Given that they only had 4 red wines by the glass, I didn't have a lot to work with, but, took my server's recommendation. It was a decent choice. Indeed, not too tanic, but it did have a boldness to it. Slightly more complex than a forgettable easy drinking table wine. I enjoyed it, but it wasn't extraordinary. 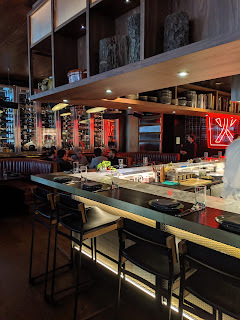 The signature dish at Kōjin, the flatbread, falls in the starters section, making up at least a third of the offerings, but they do also offer some classic seafood preparations like oysters and crudo, beef tartar, and a couple salad like things. Noting was particularly great, and the highlight for me was the mustard ... which was legit amazing, and the best part of this course. 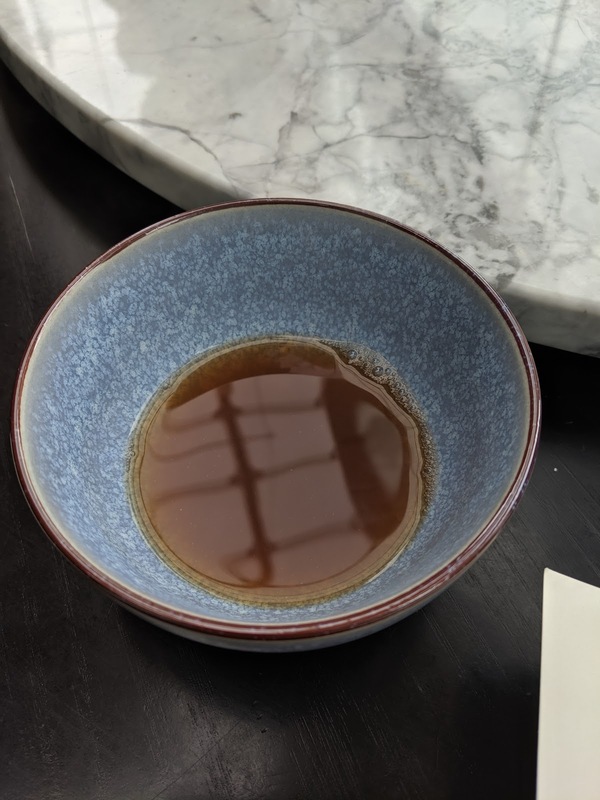 Amuse Bouche: Chicken Bone Broth. 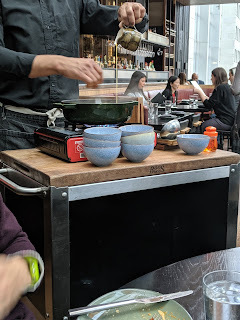 As soon as our order was sent to the kitchen, we were presented with a welcome amuse bouche, little bowls of a chicken bone broth. It was warming, perhaps nice to sip, but like consommé, it was just too rich for me. The others all enjoyed it. "Griddled flatbread made from local K2 mills cornmeal & hominy." This was *the* dish I was there for. Definitely the signature dish of Kōjin, the only one that gets consistent rave reviews. The flatbread is available in 5 varieties. They all use the same base flatbread, the different versions are just different toppings that you apply yourself, ranging from fruity red wine poached pear and ricotta to a confusing sounding marinated sardines with potato aioli and parsley, but there is only one that people really go nuts over, the most simple one of all, and not something I'd ever think to order if I hadn't done my research. You can also opt for all 5 as a big platter for $70. 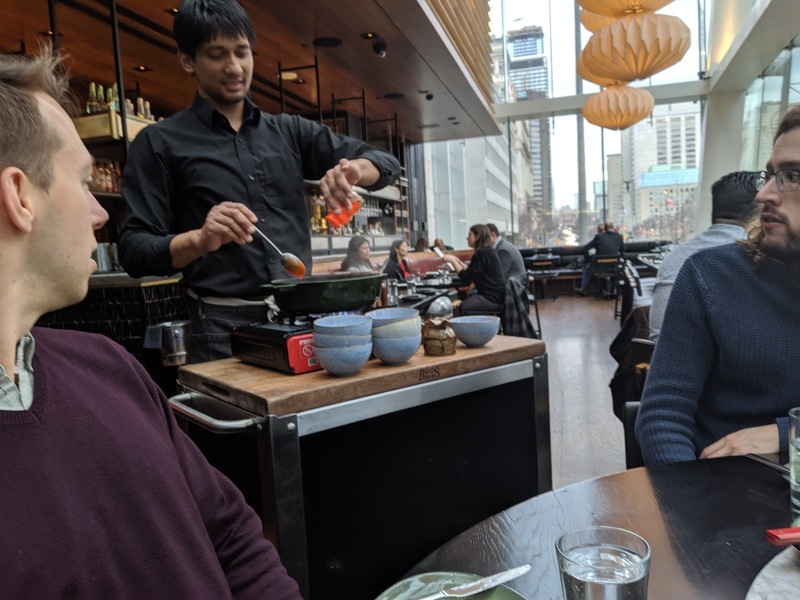 I planned to just order the one well known one for the table, but our server told us we needed at least two, probably three, for the table. I opted to be conservative and went for two, asking her to recommend our second one. The two orders came with 5 flatbreads, so I'm not quite sure how that math works out. If we had ordered one type, would we have ... 2.5 flatbreads? I think not. The flatbread really is a unique item, no question. 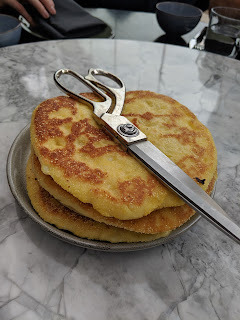 They serve it with giant scissors to cut it into wedges, but given that we had 5 people and 5 flatbreads, that wasn't entirely necessary. The bread was hot and fresh, covered in cornmeal, just like pizza bread, but had a far more unique texture. It was griddled on both sides so bit crispy on the exterior, but doughy-ish inside, and soft overall. I expected to taste more corn flavor, but it was barely noticeable, besides the cornmeal grit on the exterior. "I was not prepared for how pizza-like this would be", said one diner. We all agreed. It didn't look like pizza, we weren't expecting pizza, but ... that is kinda what it tasted like. But of course, you can't just order the flatbread. You order it with toppings, so the plain base makes sense. Drew’s Grass-Fed Butter / Spiced honey. $10. The version of the flatbread that everyone *raves* about is the ... butter and honey version. Yes, just butter and honey. I really would never have ordered this. The butter was good quality butter, and the warm flatbread was fairly perfect for slathering with it, it melted in perfectly. The spiced honey was actually a great match, and I've always been a sucker for corn bread and honey butter, and this really was just a different take on the same concept. Creamy melty quality butter, sweet honey, slight spice ... these things all did work together nicely, and it was enjoyable, just again, not life changing. Worth ordering if you go to Kōjin, but I wouldn't go out of my way for it. The flatbread with these toppings was good, fine, but not as mind-blowing as I expected, and only my #6 favorite bite overall. 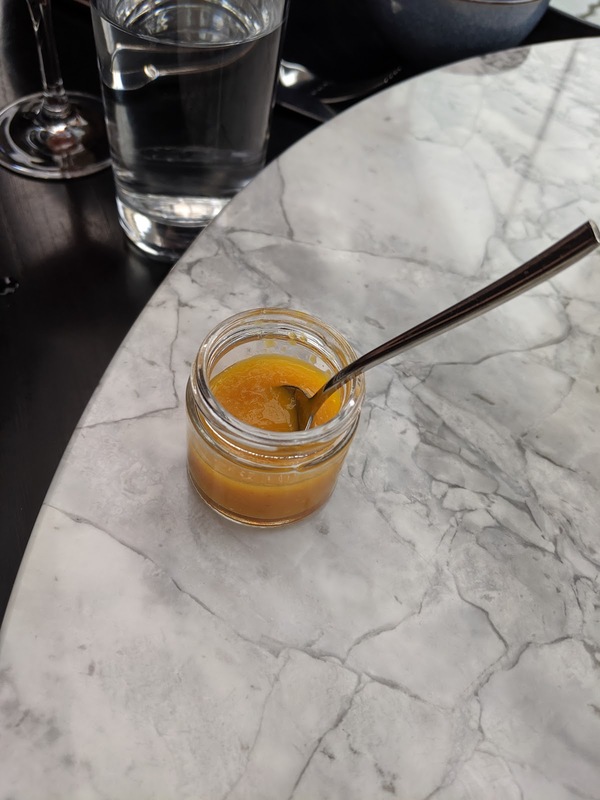 Also served with the honey, butter, and flatbread is a little jar for the Momofuku yellow pepper hot sauce. Again something *everyone* raves about, insisting that you mix it with the honey and butter. I did like the heat it added, it was spicy but not overpowering, so we asked to keep the hot sauce on the table to use on other things later. Niagara Ham & Coppa / Pickled cherries. $17. For our second flatbread, I took our server's suggestion and selected the ham and coppa, which came with a pickled cherry spread. 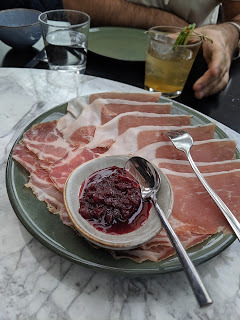 The charcuterie was fine but average, them pickled cherry jam quite tart, so slightly interesting. No one really thought these toppings went well with the flatbread at all. 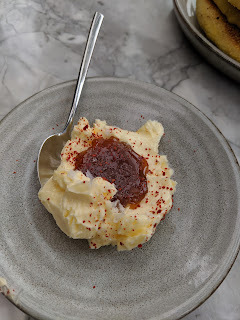 No one really was into this, and I'm still confused why our server thought it was a good recommendation, surely the ricotta or brie versions must have been better than this? None of us would order again. 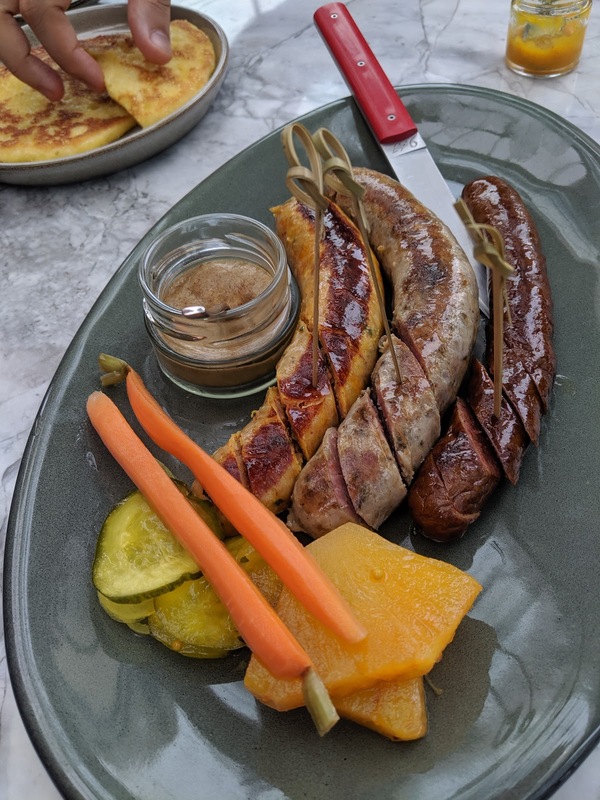 "Chef’s daily selection of sausages, made by our in-house butcher & served with Kōjin mustard by Kozlik’s ." 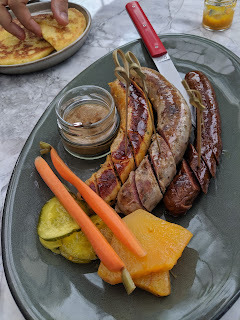 The only other dish that people consistently like at Kōjin is the sausage board, with chef's choice of three different sausages offered daily, by their in-house butcher. You can also get individual sausages during "Social Hour" in the early evening. Our platter came with an all beef smoked frankfurter (far right), a spicy pork italian sausage (middle), and the chicken and cheddar kimchi that often is raved about. All had a nice sear on them, and were shiny and looked great at first, but I found them fairly dry and underwhelming. The chicken/cheddar/kimchi was strangely soft, full of little bits, and just fell apart. Also on the platter were pickles, including bread and butter cucumbers and onions, fairly standard, carrots (I didn't try), and ... pineapple, which was at least fascinating, with the extreme sweetness somewhat balanced out by the acid. And then there was the mustard. A custom mustard made by Kozlik’s, a Canadian brand. It was ... awesome. I honestly loved the mustard. It was zesty and had bite, but it also had sweetness to balance it out. It even had texture. I adored it. I'd buy it by the bottle if I could. 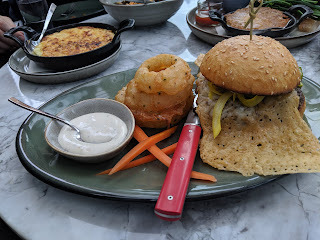 The mustard (particularly when combined with the ranch, keep reading) was my ... #3 favorite bite of the meal. No joke. I didn't want anything to do with this platter of sausages, but wow, that mustard. I think my notes say "ZOMG, the mustard" or "I really like the mustard" or "mustard + ranch = <3" in at least a half dozen places. And finally, to have some vegetables, we went for one of the two salads, a celery root salad, with julienned apples and celery root, in a creamy dressing, with huge chunks of blue cheese. Not exactly a light salad, but honestly I think the lightest item on the entire menu. 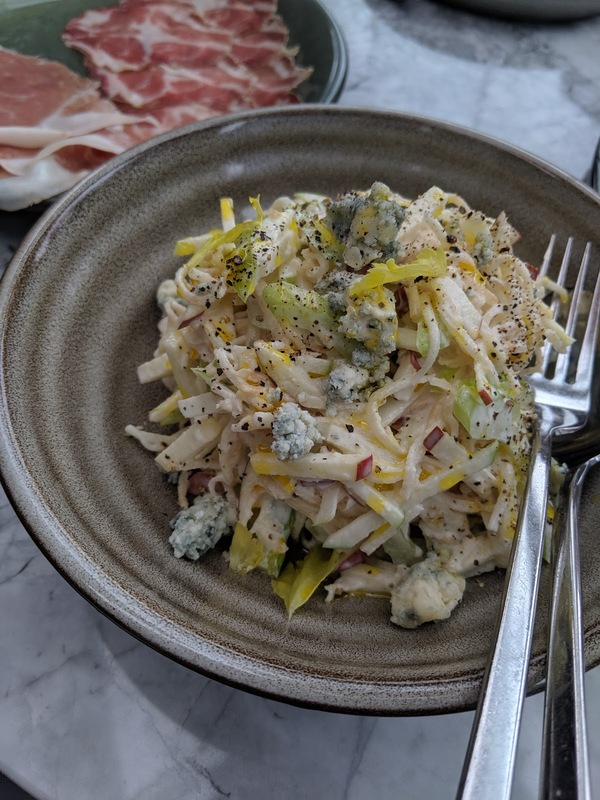 The apple and celery root were fresh and crisp, the blue cheese pungent. It was ... what it was. I don't love blue cheese, so this wasn't really for me. This dish went unfinished, and no one said much about it. And then it was time for main dishes, and sides. The main dishes focus around meat, mostly large format red meat, and are not individual portions, with the burger as the only exception. There are no vegetarian mains, only a single seafood. 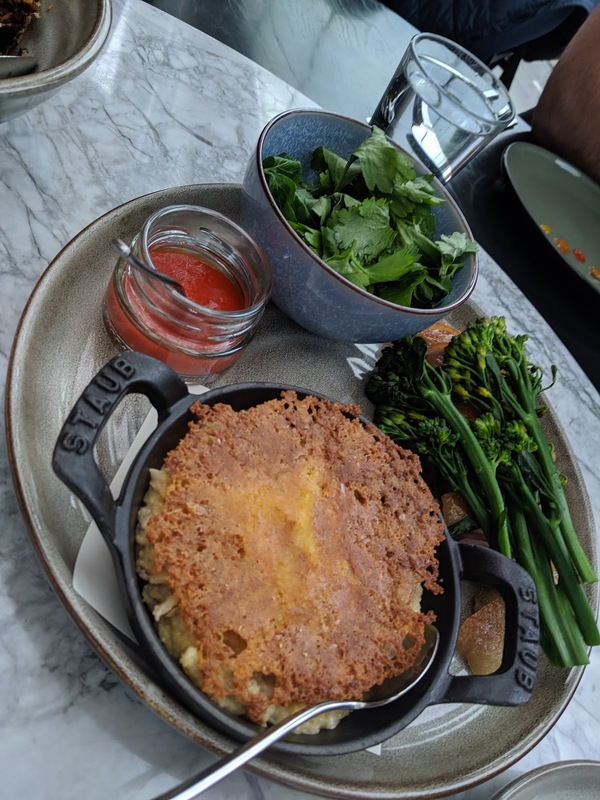 The sides are all vegetable based, and there are many on the menu, which is an odd match as the mains all come wit several (different) sides each. We ordered two mains, one of which was a full 1/2 roast duck, and two vegetable sides. Our server really, really told us this was not nearly enough protein, and suggested we add on more. I was fairly confident that 3 sausages, a full large burger, 1/2 duck, and a platter of charcuterie were more than plenty of protein for a group of 5 (honestly, that is more than one full portion of protein each already ....), and that the 5 flatbreads, side of decadent mashed potatoes, included sides of grits and onion rings were plenty of carbs, and the salad, the side of crispy brussels sprouts, and the included broccolini and pickles, plus all the other extra goodies were more than enough food for 5 people, but she seemed so concerned. I held my ground, and told her we'd order more if we needed it. As I said, we were all full after our appetizers, and enjoyed the mains/sides much less as a result. And of course we didn't come close to finishing it all. Also ... the proteins really were poorly cooked, which is what I had read reviews about, but truly didn't expect at a Momofuku restaurant. Quality control is needed here. 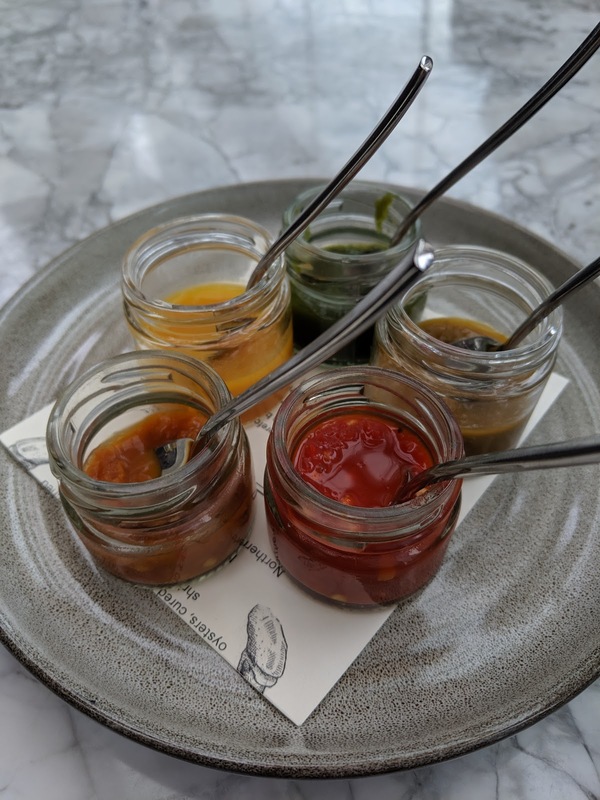 When I asked to keep the mustard and hot sauce on the table for the main courses, our server asked if I liked hot sauces, and I said yes, so she brought us this, a platter of 5 sauces (the yellow one was the same). Also in the mix were sauces described as: sambal, goose pepper, "green hot sauce", and "pineapple". Some were seriously spicy if you tried them without food - oops! I've recently discovered that I like duck. Previously, the only duck I really cared for is ... foie gras. But Air New Zealand, of all places, is were I discovered smoked duck, and I've been hooked ever since. I was excited, but concerned, to order the 1/2 roasted duck, because multiple reviewers talk about how the duck was not properly cooked. And we were warned it would take 50 minutes (which was fine, given all the appetizers, and needing a little time to attempt to want more heavy food). It was ... The. Most. Underwhelming. Dish. Ever. Seriously. I don't even understand. But let me back up a bit, as it is not very clear what is even on this plate. The broccolini is perhaps the only identifiable thing, it was, literally, just broccolini. No one touched it. The corn grits were hiding under that crispy cheese topper. The grits were fairly heavy, gloopy, but had a nice texture from the bits of cornmeal. I liked the texture. 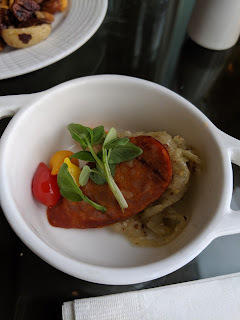 A different style than Southern style grits I am more familiar with, certainly missing the creaminess. Best with hot sauce. Points for serving in a cute cast iron. The cheese topper was unnecessary, particularly given all the other cheese we had coming in this course. Where was the duck? Oh, it was served *under* the broccolini. Yeah, what? Strangest plating ever. And the duck was ... really not good. Not properly cooked at all. Incredibly chewy, yet underdone, visible bloodlines. I struggled to cut off a bite, and then struggled even more to chew it. I wanted to spit it out, as I really couldn't chew through it. The skin was crispy, but it still seemed like the fat layer wasn't properly rendered. And finally, a bowl of what looked originally like just cilantro, but turned out to be a bowl of ... lentils. Well, under a ridiculous amount of cilantro. We didn't even find, nor notice, the lentils until I was picking around at things at the end. I hate lentils, so I didn't want to try them, but I made someone else do so, for you dear readers. The conclusion? They were no different from any other lentils out there. At $59 this really was ridiculous, poorly prepared protein, confused plating, and just seemed poorly conceived in general. I felt like I was missing something. The majority of the meat entrees are steaks of various cuts, cooked over a wood fire, but I had read soooo many negative reviews of them that I opted for the burger instead. Plus ... I knew it came with what looked like fabulous onion rings. The onion rings, 3 of them, actually were fabulous. Tempura battered, crispy, oily and heavy but in a good way, thick chunks of onion inside. I may have taken a whole one for myself, even though we had 5 people, and only 3 rings. And no, I didn't take the little one. Gulp. On the side was little bowl of ranch (and, soft/wimpy carrots ...), and I absolutely loved dunking the onion ring in the ranch. The ranch itself was extremely flavorful, tangy, and herby, and I really quite liked it. 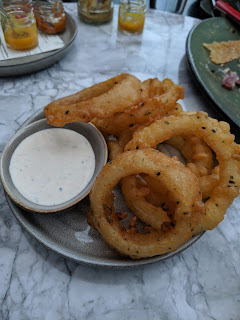 The onion ring, with generous ranch, was unquestionably my #1 bite (and #2 and #3, really, since it took three bites ...). The burger itself was a mixed bag. The bun was nicely toasted, but heavily buttered. Again, everything was just amped up in the heaviness department. It was ... a fine bun I guess. The burger patty itself was cooked ... well done. Not medium-rare as I'd expect, or even medium, or even medium-well. Actual well done. And it was only lukewarm when it arrived. The flavor was fantastic, it had a great char on it, but I was fairly shocked that the burger was so well done, and I was saddened that it didn't arrive warm. 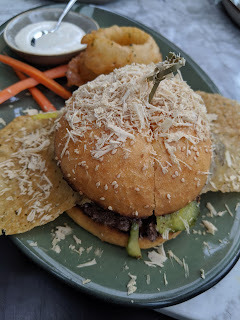 Also on the burger were more bread and butter pickles like we had on the sausage board, what seemed to be chunks of caramelized red onions, some kind of "special sauce", and ... yes, the cheese component. Inside the bun, it was melted gruyere, lots of it, and coming out the sides, as you can see, is an extensive cheese frico. It looked like lava coming out the sides. Certainly interesting visually, unique, but much like the cheese topper on the grits, it was just rather unnecessary, at least in that quantity, and with all the other heavy elements. A little for crunch and concentrated awesome gruyere flavor was nice though. So, I am very mixed on this. The burger patty with special sauce was actually my #4 bite, I loved the flavor in the beef, but it was not prepared how I'd expect, and the onion ring and ranch were the highlight of my meal, but I can't exactly recommend this as an overall well executed dish. On the menu, after the steaks and burgers section, is a call out to a foie gras torchon supplement, for $15. You know how much I love foie gras, and now that it is back to being banned in California, this was very appealing. So I added it on to the burger, expecting some foie to be perched inside somewhere. It wasn't. But after our food came out, another server came over with a torchon and grater, and shaved it tableside. Um, on top the burger. On ... top of the burger, as in, on top of the bun. Uh, what? And this is how much he gave. How was this a $15 supplement? And really, that isn't quite what I had in mind. Another strange plating/serving element here. I may have said something about "can you just shave it directly onto my plate", joking (ish), and ... my wish was granted. Still, I can't say I felt like I got my $15 worth, and the others certainly did not, but at least I was able to taste it a little, since I had it separate. 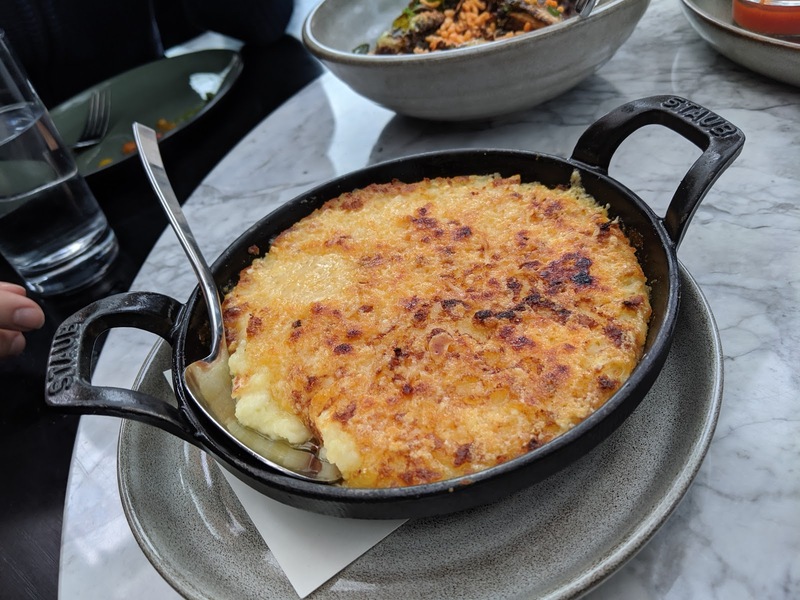 I had read about the mashed potatoes, and knew they would be rich, and come smothered in cheese, but I was still a little shocked by the side of potatoes. Just like the grits, served in a cast iron (a bigger one), and just like the grits, and the burger ... crusted in cheese. Warning, as the menu certainly doesn't prepare you for this. So much cheese in this meal. The potatoes were rich, thick, and mounted with too much cheese/cream/butter to really be enjoyable, losing all creaminess and any actual potato taste. I love the Joel Robuchon potatoes (which I first had at L'Atelier de Joël Robuchon in Paris, and then again at L'Atelier de Joël Robuchon in London) which are seriously the least healthy mashed potatoes out there, so its not like I want lean mashed potatoes, but these just didn't do it for me. The cheese crust on top was unique, but, meh. These also went unfinished, a single bite was really all you needed. 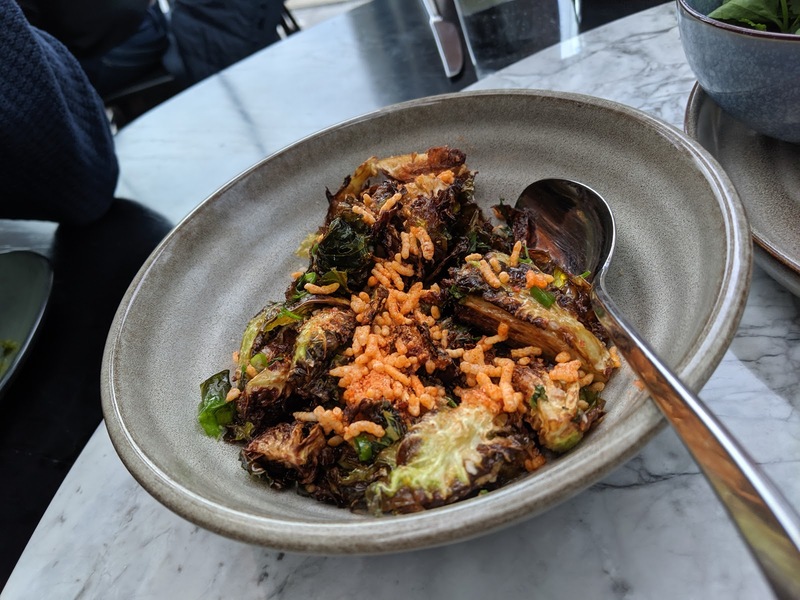 The final vegetable side that we originally ordered was the crispy brussels sprouts, the suggestion of our server to add more vegetables, and her only food recommendation that I was pleased with. The sprouts were indeed quite crispy (thanks, oil! ), very flavorful as they were coated in an addicting fish sauce vinaigrette (mmm! ), and topped with crispy flavorful puffed rice. I really loved the sauce. I really did enjoy this dish, and besides the condiments, is the only dish I went back for more of. Great textures from the crispy sprouts and the rice puffs, and quite flavorful. #5 bite overall for me, best actual dish for me, and #1 dish for another diner. So ... remember how I mentioned being a horrible person and taking a full onion ring, leaving my dining companions to not all get one? Yeah, I was called out on this, and our server overheard it, and eagerly offered to order us a side of onion rings. Turns out you can do that, they just weren't on the menu. We certainly didn't need these though, particularly given how late into the meal they arrived given the late order. I really just felt bad raving about the rings, when someone didn't get a chance to try. This batch however was ... not nearly as good. In fact, actually not good at all. Those of us who had rings from both batches agreed and were confused. These were oily and soft. Not well drained. At least they were hot and fresh? The ranch was again amazing though. At this point, I was over-full, but grumpy, having not really loved everything. And we now had a big bowl of delicious ranch in front of us. And the amazing mustard. So ... I decided to try combining them. They were magic together, better than the sum of the parts. I wish I could say I had something to dunk in this creation, but, I didn't. I literally sat there eating spoonfuls of ranch-mustard, and loved it. #2 bite. For reals. (This is also how I discovered the lentils, I was looking in the cilantro bowl for something to dunk in my magic sauce). And then ... 15 minutes later, an awkward server arrived tableside, explaining he had the rest of our duck dish. We honestly were all DONE eating. There was tons of food left, and we were done. Too full. Ready to move on. And ... it was time for a cooking show. 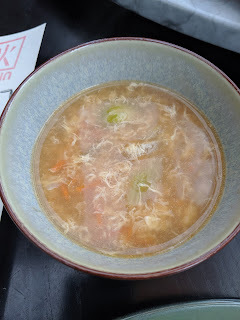 He prepared egg drop soup, I guess with the duck broth as a base, swirling in the egg slowly beside us. Individual bowls were then distributed to us all. I ... don't like egg drop soup. I tried it, but as I expected, just totally not for me. It had good size chunks of veggies, and one diner said it was his favorite thing, so clearly, this is just my preference. By the time we hit dessert, we were all uncomfortably full, and full of such heavy cuisine. 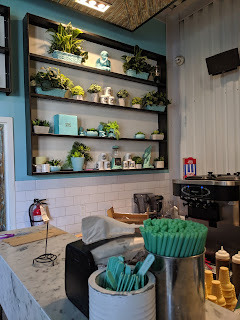 I was honestly heartbroken, as, even though I had read literally no positive reviews of Kōjin desserts, I ... I just love dessert. We looked at the menu, which had 4 options: chocolate souffle (with a 20 min warning), apple crisp (with white cheddar ice cream! ), ice cream cake (featuring peanut butter and chocolate), and blueberry cobbler (which gets awful reviews). Of our group of 5, 2-3 of us said we'd have a "bite" but no one was particularly interested in anything. We ruled out the souffle since we didn't have 20 minutes (needed to turn the table around faster, made clear to us by the staff), and the blueberry cobbler since it was universally hated by every review I read. We opted for the ice cream cake, sorta randomly, although I was a bit sad to miss the white cheddar ice cream. The ice cream cake came quickly, and was a very large slice. It was more than our group needed at this point, and most certainly designed for sharing. It was decent, although clearly served straight from freezer (to rush us out? ), and would have benefited from warming up a bit. 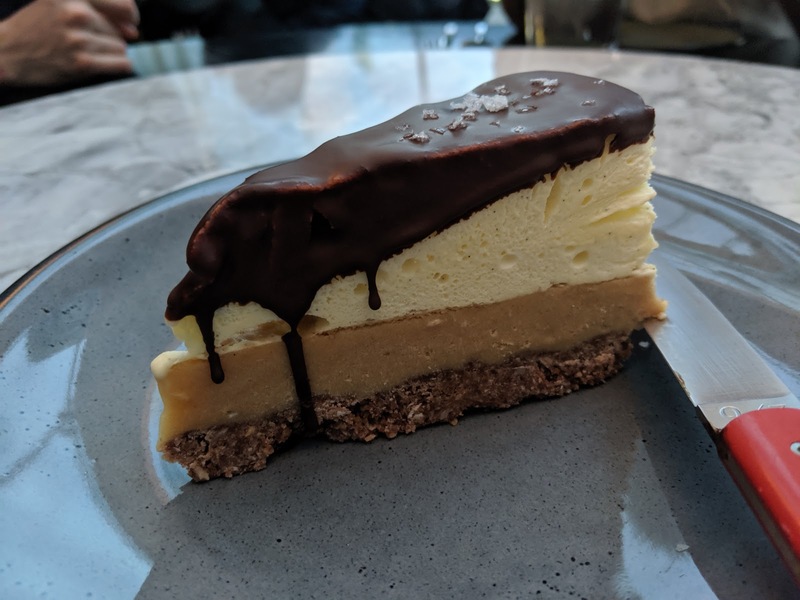 We all hated the base, ridiculously hard, and we think coconut based, likely inspired by Nanaimo bars. I discarded my rock solid chunk quickly. Above that was a layer of delightful thick rich peanut butter. I'm not sure what else was mixed in, as it really seemed mostly like just amazingly smooth creamy peanut butter. Great peanut butter, so not a bad thing, but, very plain. On top of that, the ice cream. The ice cream looked vanilla, but I believe was maple. The flavor was lovely, the consistency reasonable, although, again, a bit too frozen still. Then, dark chocolate shell, just like you get on an ice cream novelty, just clearly higher quality. It had a great snap to it, intense chocolate flavor. Finished with large chunks of sea salt, which I loved, and immediately identified in my notes. It amped up all the great flavors. But one diner said the dessert was far too salty for his tastes. 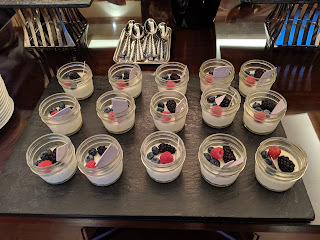 I was fairly satisfied with my few bites, but I wouldn't call this an extraordinary dessert by any means. I'm pretty picky about my granola. I like a specific style. I was recently at an event where Bear Naked was giving out granola samples. It didn't look like the sort of granola I'd like, as there were no clumps. I want legit clumps, as I like to eat it by the fingerful. Sure, I also put it on top of greek yogurt, or sometimes sprinkle it on ice cream, or, rarely, add milk to it, but mostly I just like to munch on it. With my hands. I'm a snack foods girl, a serious muncher. Granola sans clumps is no good for this. 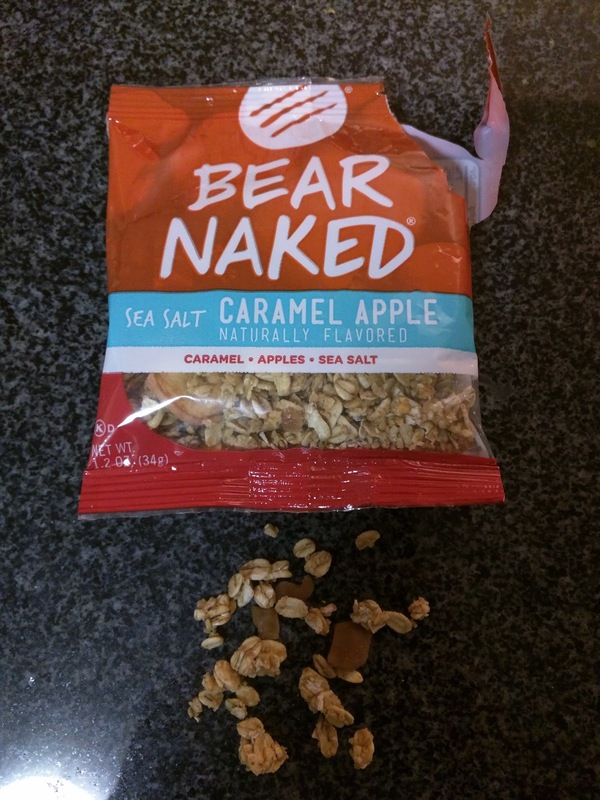 Bear Naked makes a slew of different granolas, some of which sound great like Maple-Licious Pecan and Chocolate Elation. Some sound ... intriguing, like "Fruit & Nutty Goodie Bag". Others are loaded with protein, flax, or are reduced fat. They also make energy bars, layered snack bars, and trail mix, all featuring their granola. I didn't get to pick my samples, but received two different granolas to try out, neither of which were the flavors that sounded most appealing, but, I'm not one to turn down a freebie, so, I tried it. 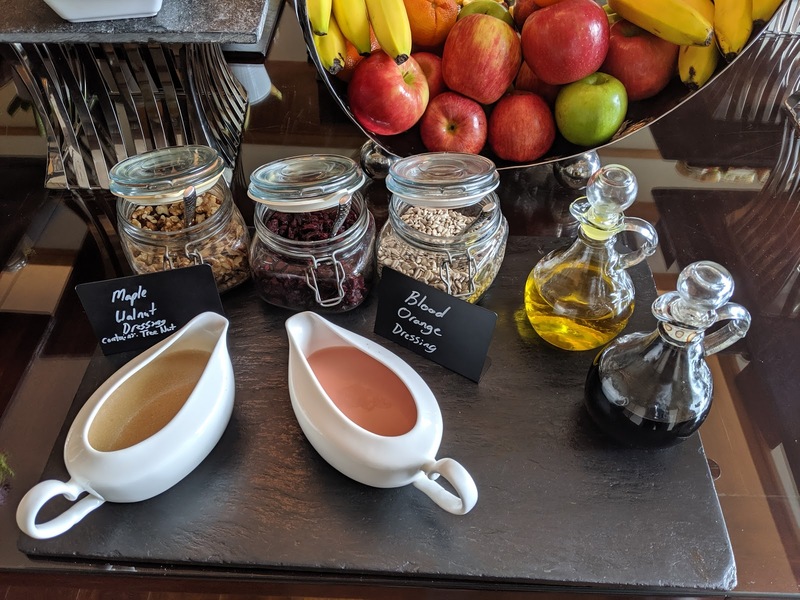 While I still didn't like the clumpless form of this granola, the flavors were good, so if you like clumpless granola, this could be for you. My favorite granola remains locally made Worthy Granola. "Our savory, sweet mix of soft-baked granola, coconut, whole almonds and cashews, blended together with the spicy zang of Eastern curry is outta this worldly!" The first sample I received I really wasn't excited for at all. 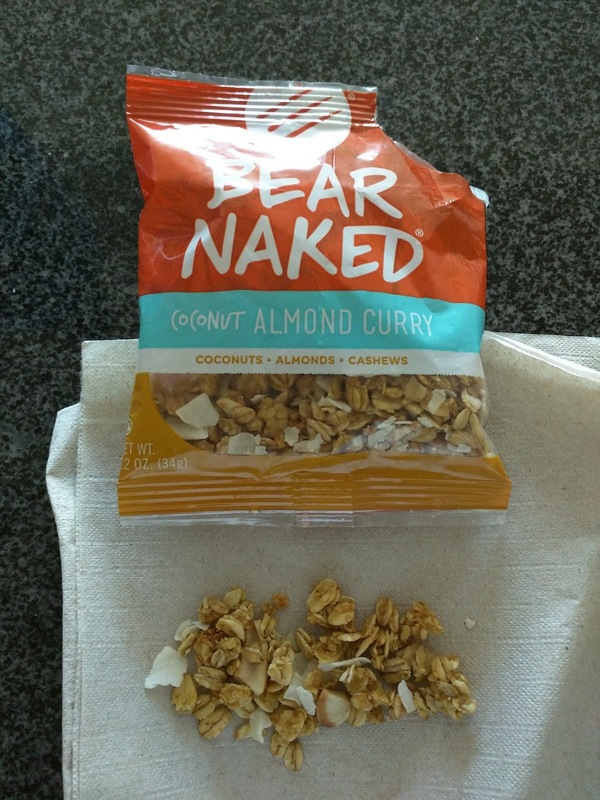 Coconut almond curry? I'm not opposed to savory granola, but, don't generally like curry flavors. Given the flavor, and the visual appeal of the granola, I was pretty certain I wouldn't like it, but I tried a few bites before passing it off to Ojan. As I could tell from visual inspection alone, it had no clumps. Strike one. 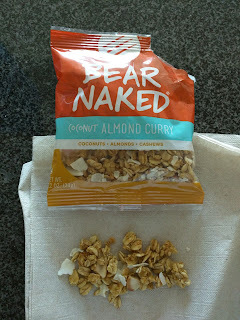 In the mix along with barely toasted oats was shredded coconut and almonds, as expected given the name of the product, plus curry powder, made up of cumin, turmeric, red and black pepper, cardamom, fenugreek, and coriander. It tasted like, well, curry. I didn't like it, but if you like curry, and are interested in a savory granola, I'm sure this product could be interesting. It did have some sweetness from honey, brown rice syrup, dried cane syrup, and maple syrup, but the curry made it pretty savory overall. "This yummy granola pairs the sweetness of caramel with the tart and tanginess of an apple, all topped with savory sea salt for a truly incredible and unforgettable flavor." Well, huh. This was good. I'll start with the negative - obviously, the form. I like my granola to have big clumps. I like to munch on it. Munching is hard to do with this style of clumpless granola. But, this really was tasty. Simple granola flakes, sure. But also in the mix were dried apples and hard caramel candies. It was a bit strange to bite down on the hard caramels, but, the caramel apple flavor was pretty awesome. The sea salt was unexpected. This was a sweet granola, but, then the salt was very pronounced as well. This mix was ok to munch on, but really, it just demanded to be sprinkled over an ice cream sundae. Which I promptly did. 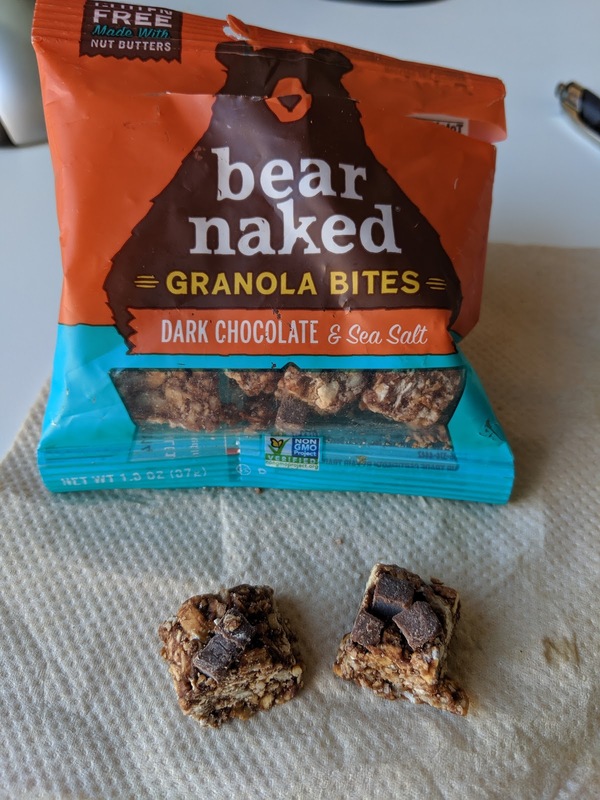 Eventually I discovered that Bear Naked makes a product much more suited for me: granola bites! little snack size nibbles of their granola. These sounded quite promising. "There's an old bear saying: Chocolate at night, bear's delight. Chocolate in morning, better get hoarding. This sage advice helped inspire our Dark Chocolate Sea Salt Granola Bites, featuring Fair Trade Chocolate and sea salt with a blend of peanut butter and cashew butter, whole grain oats, sunflower seeds and millet. " I did like the form factor, not clumps as I was hoping for, more deliberate chunks, but still, quite munchable. And I did like the decent size chunks of quality dark chocolate, and the pop from the sea salt. But ... I didn't care for the base, the sunflower seeds and millet aren't really my thing, but I think it was the cashew butter that threw the flavor off for me, it just trended too bitter. So, better form factor, quality chocolate, but not the ingredient mix for me. Many hotels of a certain calibre offer a club level/executive lounge/concierge lounge, usually something you can add-on to your room for a fee, or access is included with loyalty status, offering a reasonably quiet space, some kind of breakfast (usually continental), drinks and perhaps light snacks throughout the day, and little bites in the evening (and alcohol, outside the US). Some will have conference rooms you can use, all usually have a small business center and wifi. 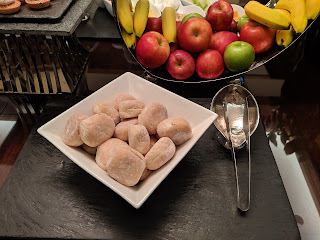 The quality and range of the offerings is vast however, sometimes just crowded tiny rooms with some stale bagels in the morning and bags of chips in the evening (like the Westin Copley Place, Boston), sometimes beautiful spaces with the best views on the property and elaborate offerings and top-notch service (like the Sheraton Grande in Sydney! ), sometimes just a nice place to spend time, even if the offerings aren't great (like the Renaissance Midtown in NYC). 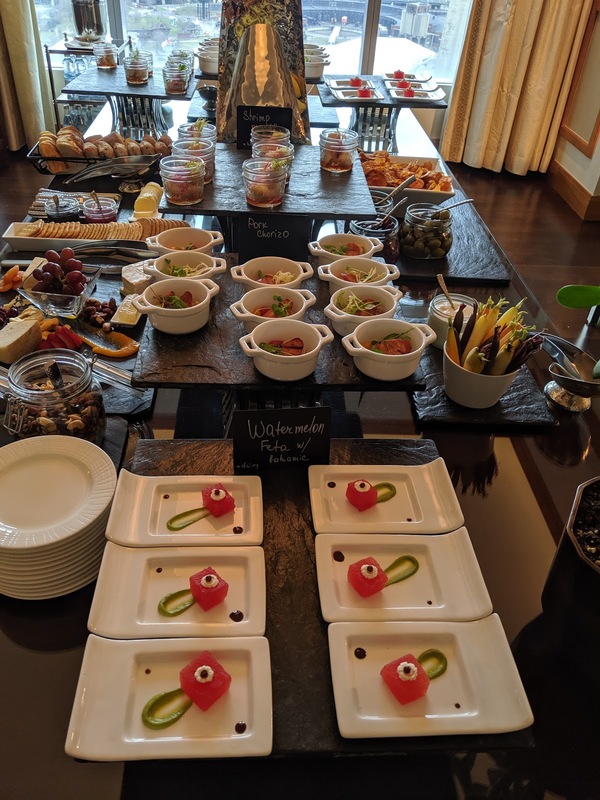 Some have extras like great afternoon tea service (like the Prince Gallery in Tokyo), others have a live chef station rolling sushi (like the Westin Tokyo). 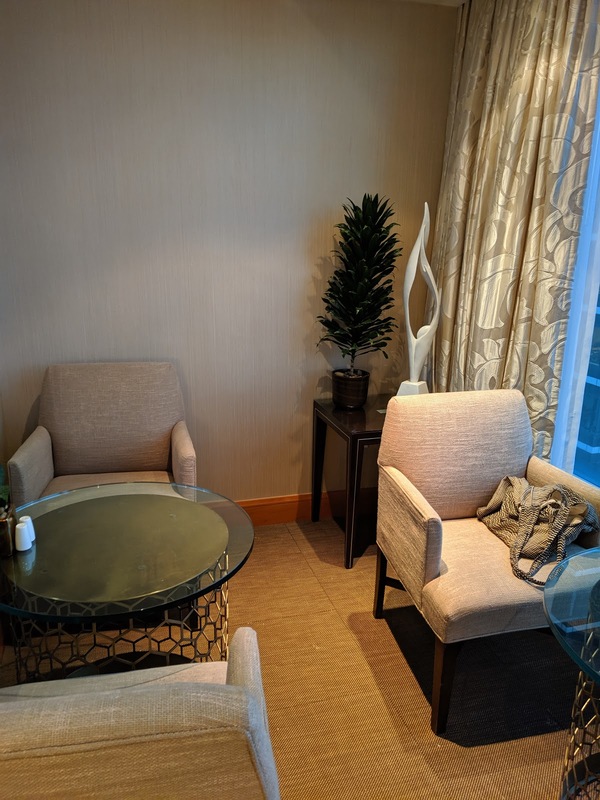 Usually you can use them as a place to grab a water bottle on your way back to your room, but others absolutely forbid you from taking anything from the lounge. You never really know what you are going to get. The Ritz-Carlton chain is known for the club. And unlike any other property, your loyalty, no matter how high of status, does not get you in. You must pay extra, usually considerably more than any other property, to get in. 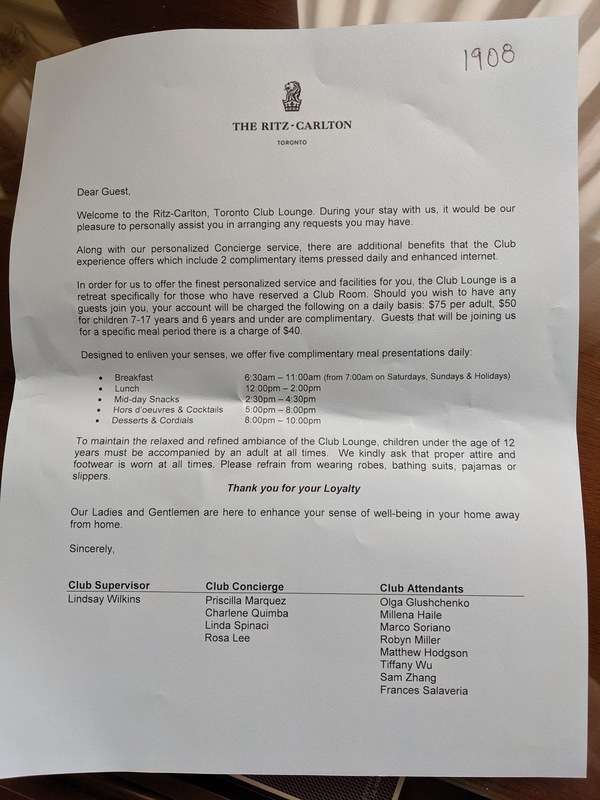 Let's say, I had high expectations for my first visit to a Ritz-Carlton club, in Toronto. I expected it to be on par with the higher end of the lounges I have experienced internationally. "The Ritz-Carlton Club® Level is a communal space designed to make your stay unforgettable in surprising and delightful ways. Whether it’s a quiet moment to work alone or a place to connect with fellow travelers and share stories, the Club Level’s unique set of personalized services and amenities will cater to your every need. 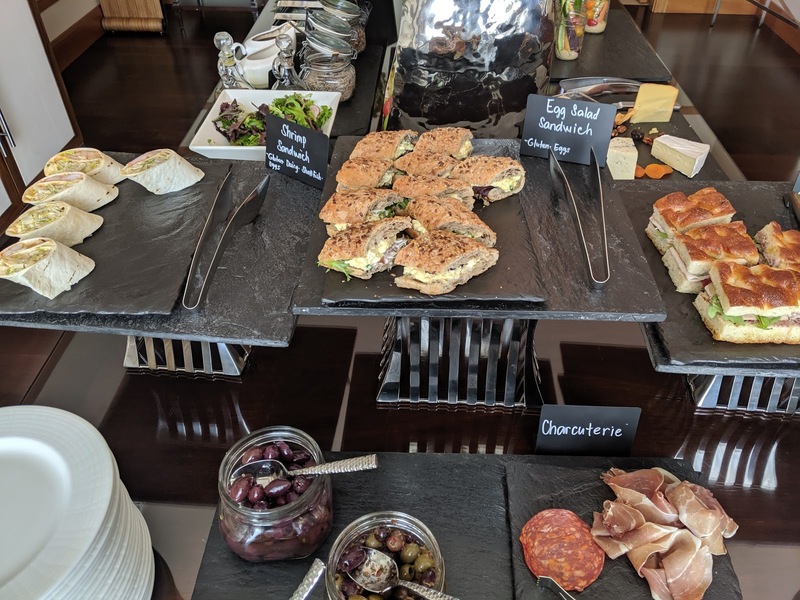 Every Club Lounge offers an array of complimentary culinary presentations, personal concierge services and elegant décor intended to create an undeniable sense of belonging with your fellow travelers." I also was worried it might be a bit too ... ritzy. Would I need to dress nice to go in, even at breakfast? Did I need to act proper? Would it be stuffy? Again, the dress code, other clientele, staff personalities ... they vary widely in these settings, and I had no idea what to expect. Breakfast: 7 to 11 a.m. 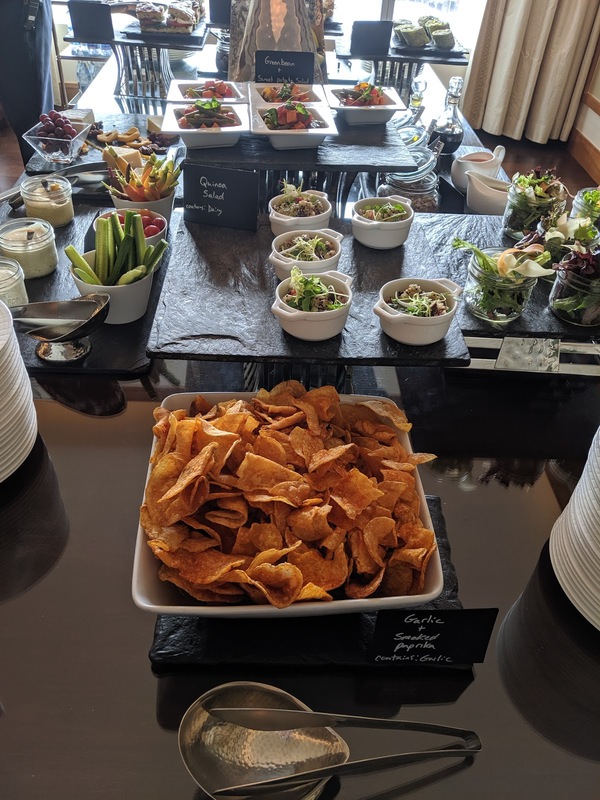 Lunch: 12 to 2 p.m.
Light Snacks: 2:30 to 4:30 p.m.
Hors' d'oeuvres and Cocktails: 5 to 8 p.m.
Desserts and Cordials: 8 to 10:30 p.m. It certainly sounded far fancier than any other lounge I had visited. "The Ritz-Carlton Club® Level redefines the luxury hotel experience, combining intimacy, comfort and exclusivity with the personalized service and attention to detail that are the hallmarks of The Ritz-Carlton. 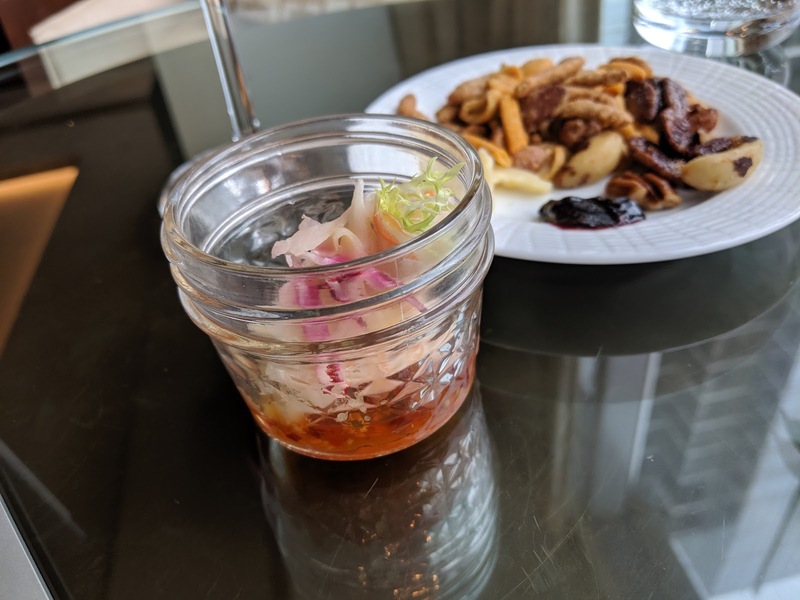 This oasis is often referred to as a hotel within a hotel in a well-appointed, relaxed lounge environment overlooking Lake Ontario and the CN Tower. " Normally, at the Toronto Ritz-Carlton, the lounge is located on the top floor, in a dedicated space. During my visit however, it was in a temporary location, basically just re-purposing the top Simcoe suite, on 19th floor. The renovations to the real lounge were *supposed* to have finished the week before I visited, but ... #construction. 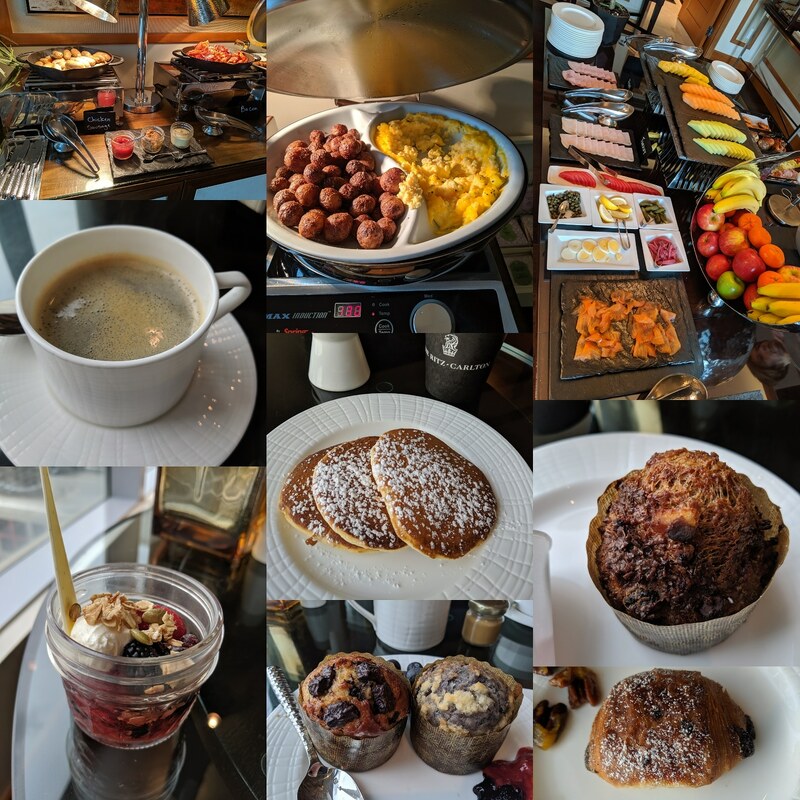 I visited multiple days for breakfast and lunch, and one evening for canapes and desserts. I was not blown away. What did stand out to me was the atmosphere - it wasn't stuffy in any way. The first time I was greeted I was told to treat the space like "an extension of my room", and I really did quickly feel that way. 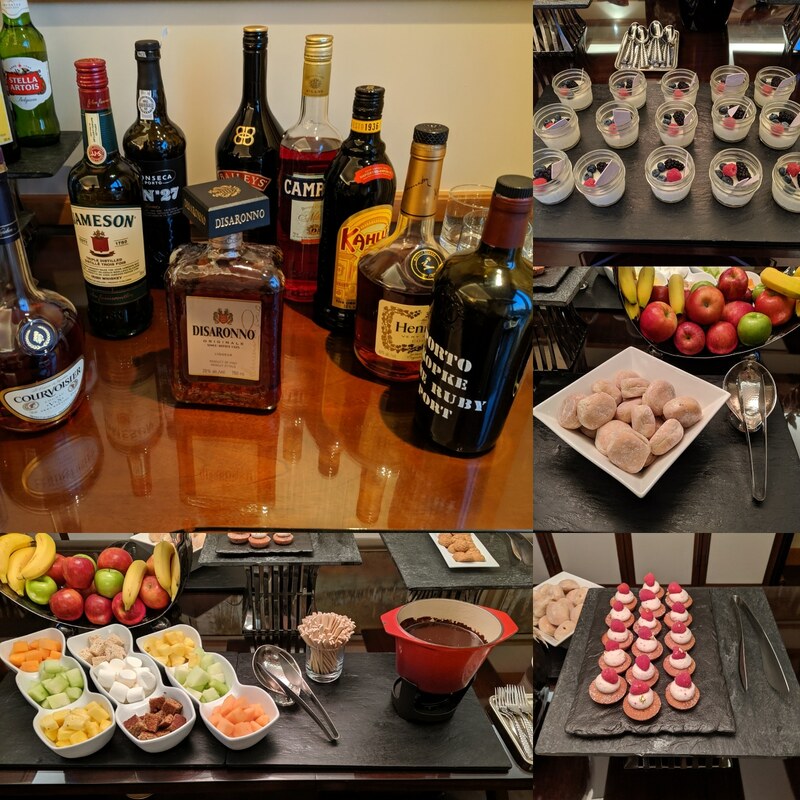 Everyone, guests and staff, were relaxed and comfortable. In the morning, people were even in pajama pants, even though the letter had said that was explicitly not allowed. In the evening, folks walked in and out with glasses of wine. One afternoon, someone was celebrating a birthday party in there. It was also never crowded. The additional fee, and not offering access to elites, certainly kept it calm and exclusive, something I appreciated. Another thing that stood out were the staff. Staff were available to help you if you needed something, but otherwise you were free to just help yourself, and do your thing. They did take the time to introduce themselves, ask my name, and learn a little about me, but otherwise let me be, unless I looked ready to engage. All this I greatly appreciated as well. 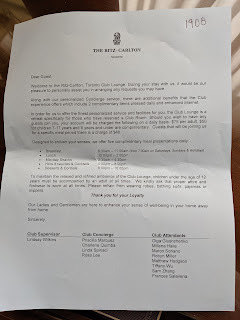 That all said, this is "Julie's Dining Club", so I'm not really here to talk to you about the staff or the property, although, I can say, they are at the top of their game. The attention to detail and calibre of training is evident the moment you set foot in the door. 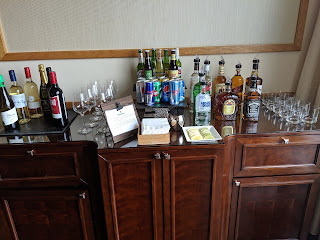 However, I can't say I found the lounge offerings to live up to what I was hoping for, or even to international lounge standards. There were a few highlights (ZOMG the muffins at breakfast! ), but, nothing was nearly as extensive, nor as quality, as I expected. It is hard to know which elements of my visit that were subpar (e.g. 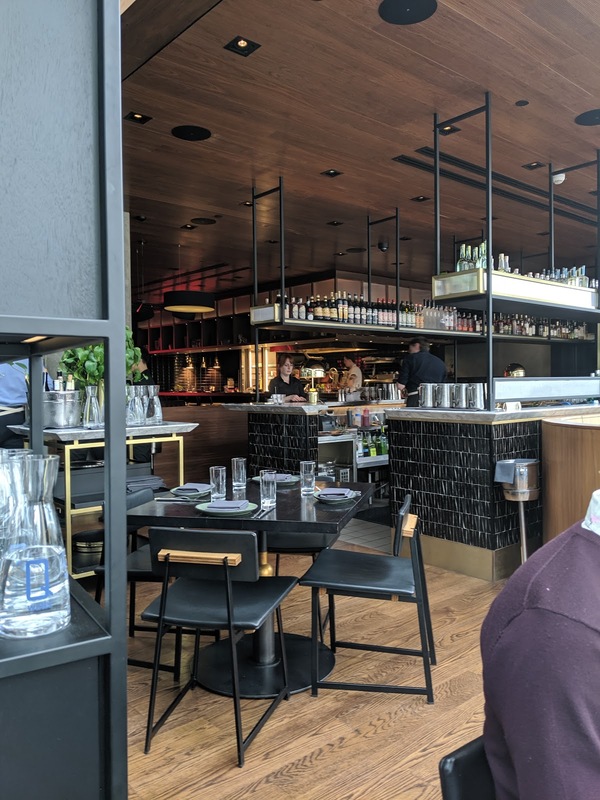 lukewarm hot foods) were related to the strange location, and clearly, it isn't quite the same as a space designed for a lounge, rather than a suite for living. 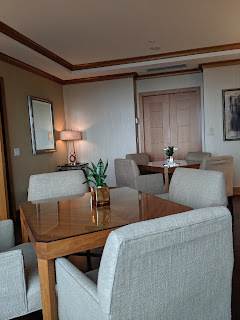 During my visit, the lounge was located right off the elevator on the 19th floor, the Simcoe Suite, certainly a better temporary location than other temporary lounges I've used (like the one at the Sheraton in Paris, basically just a side of the bar!). The layout was a collection of small rooms, furnished mostly with tables for 4, with fairly comfortable chairs. A side room had couches, and the further back room was where the buffet was set up. A few tables for two were also scattered about. No room had more than a handful of tables in it, which created a very private feel. Most visits, I had an entire room to myself. The views were decent over the city, and yes, of the CN Tower. The best part for me? 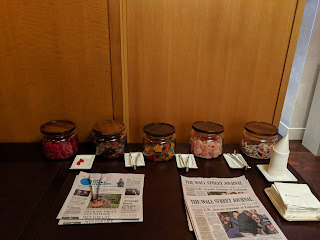 Immediately as you get out of the elevator was candy. All day. Every day. Self-serve candy jars. With little cones to fill with candy to take away. Perhaps an attraction for the kids, mostly, but, let's just say, I couldn't walk past without filling up another cone. The lineup was gummy bears (a soft style, but not the chew I like), gummy worms (a more firm style, still not the chew I like), little raspberries (more like fruit chews than candy), sour keys (good! 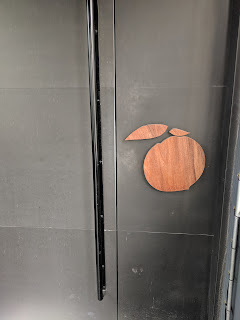 I liked the sour, I liked the chew), and ... sour peaches (soooooooo good. Really peach flavored, awesome chew, great size). Those peaches were my main attraction, but my companion loved the keys. 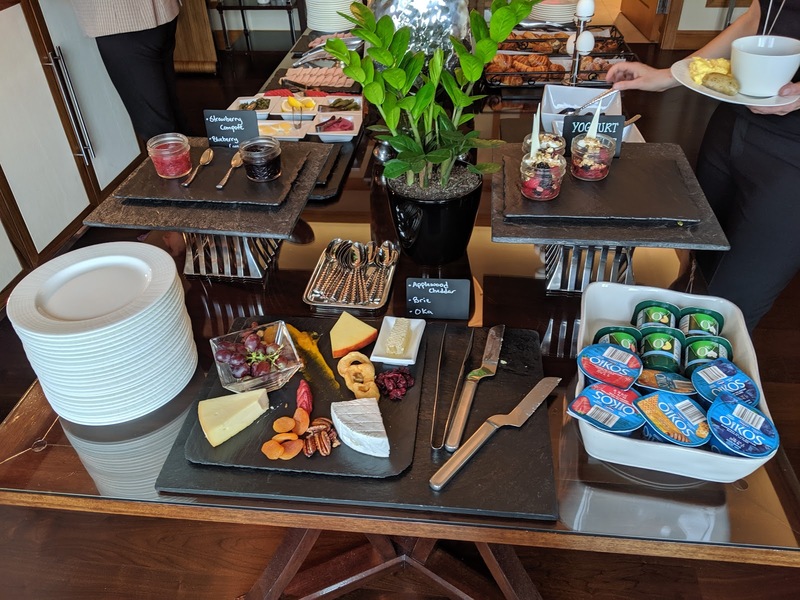 Breakfast is a standard continental, with a selection of fresh fruits, sweet pastries & homemade breads, yoghurt, cereals and granola, local charcuterie, cheeses and smoked salmon, freshly brewed Pilot coffee, Sloane teas, and selection of fresh juices, and a very small number of hot items. I found most of it fairly boring, but was beyond shocked when I discovered just how very good the muffins were. Self-serve regular coffee from a carafe is available, with espresso drinks, and decaf, requiring ordering. The regular coffee wasn't great, the Nespresso in my room brewed far superior coffee, so I quickly learned to brew my own and bring it. I ordered decaf one day as well, and it too wasn't very good, just tasted kinda old and stale. Again, the Nespresso in my room yielded better results, so, I went for that instead. Fruit, Smoked Salmon, Deli Meat. 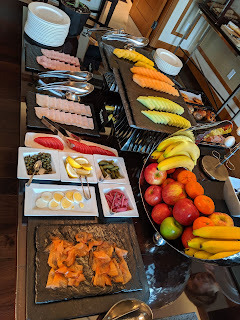 The fruit lineup was basic whole fruits (apples, bananas, oranges), sliced melons and pineapple (quite pale looking), and some berries (not very flavorful). 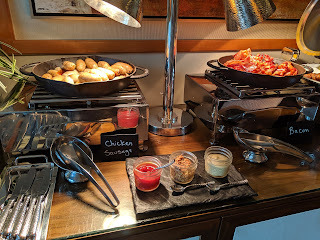 I tried the smoked salmon, served with traditional accompaniments on the side, and it was fine, but a softer style than I prefer, and not very smoky. The ham and turkey slices looked like generic deli meat, but the tomatoes were shockingly ripe, juicy, and flavorful. Not sure how they got such great tomatoes at the end of winter, but much appreciated. The cheese platter seems to be a signature item in the lounge, available during breakfast, lunch, and evening canapes, always with three cheeses (that did change), dried fruit, grapes, honey, and a fruit compote. The lineup this morning was Applewood Cheddar, Brie, and Oka. All fine but not particularly great, the later of which reminded me of munster, which I don't care for. 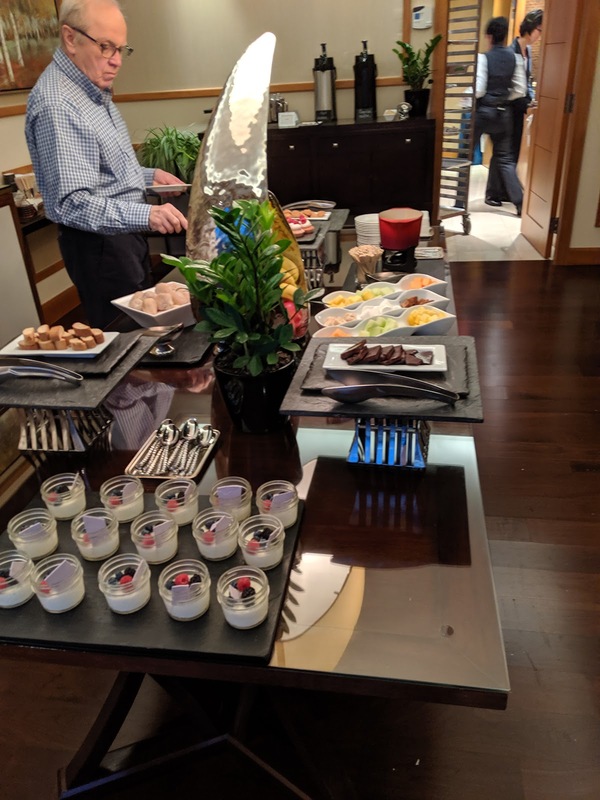 Individual packaged yogurts (Oikos, multiple flavors) and assembled yogurt parfaits round out the end of the buffet. "Mixed berries, granola, honeyed yoghurt." 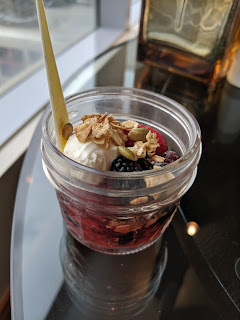 The yogurt parfait jars looked wonderful, but I didn't care for them at all. The composition of ingredients seemed off. The stewed fruit compote was just too sweet and odd, way too much of it. There was only a little scattering of equally generic granola. The fresh berries weren't particularly good, just generic out of season berries. The yogurt itself was a very small portion of fairly standard slightly thick tart greek yogurt. I did like the white chocolate shard sticking out, but I'll admit, this is not normal in a healthy yogurt, granola, and fruit parfait. The most common juices (orange, grapefruit) were available to self-serve but a sign indicated that others were available on request. Again, likely in the larger lounge they have more just out? 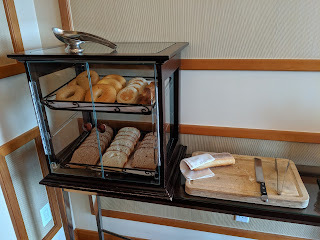 Bagels, English Muffins, Toast, Baguette. 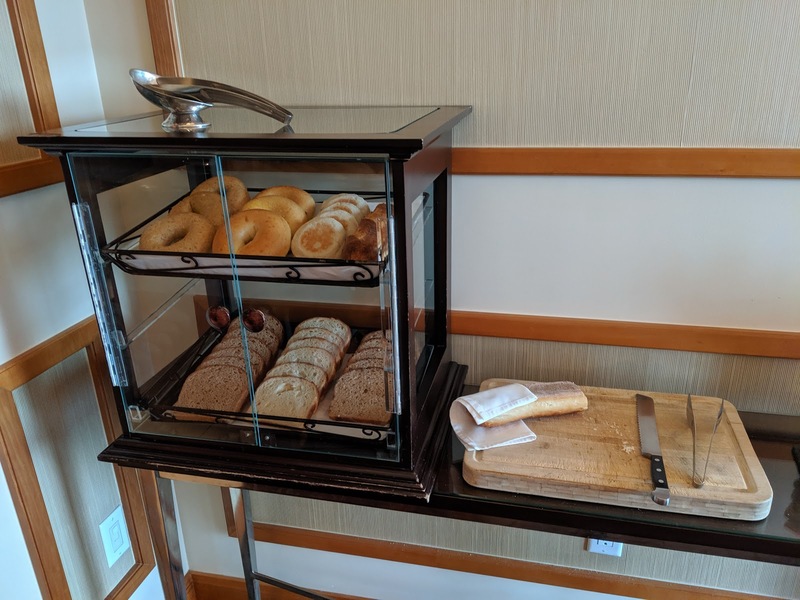 Breakfast breads are available to toast your own, with a classic toaster on the side. The baguette was particularly fresh, good crust, really soft interior. Perhaps locally made? Peanut Butter / Jam / Cream Cheese / Butter. Toppings for toast included little jars of jam (strawberry, orange marmalade, and raspberry, all Greaves brand, a local artisan jam), mini jars of peanut butter, three types of cream cheese (plain, lite, herb), and butter. I liked the butter quite a bit. I used it on many of my muffins. The baked goods lineup is where I first headed, as I do love my baked goods. 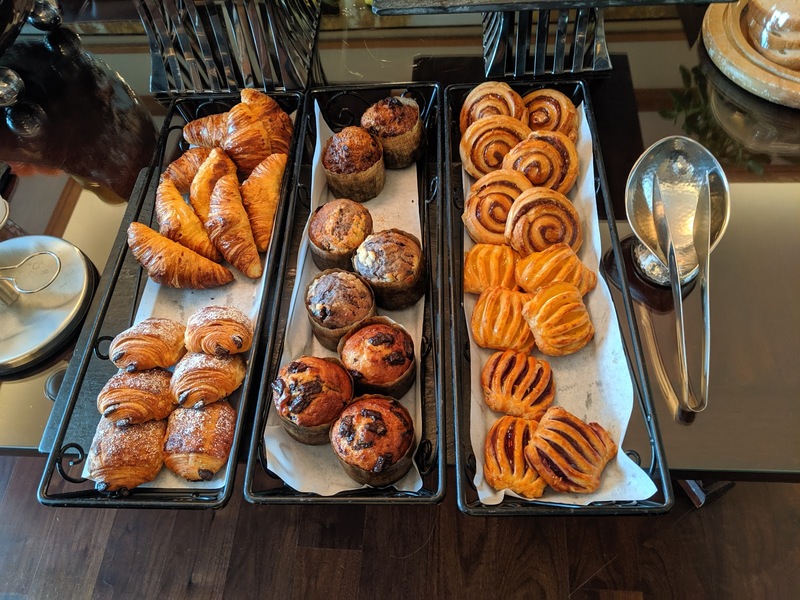 It was fairly standard: croissants, fruit danishes, cinnamon rolls, and muffins. They all looked fairly average. However ... the muffins turned out to be fabulous. Actually fabulous. To say I was pleasantly surprised is an understatement. These are muffins I'd actually purchase. 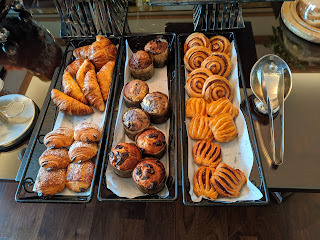 I did not try the danishes or cinnamon rolls, which really surprised my companion. The muffins were just too good! 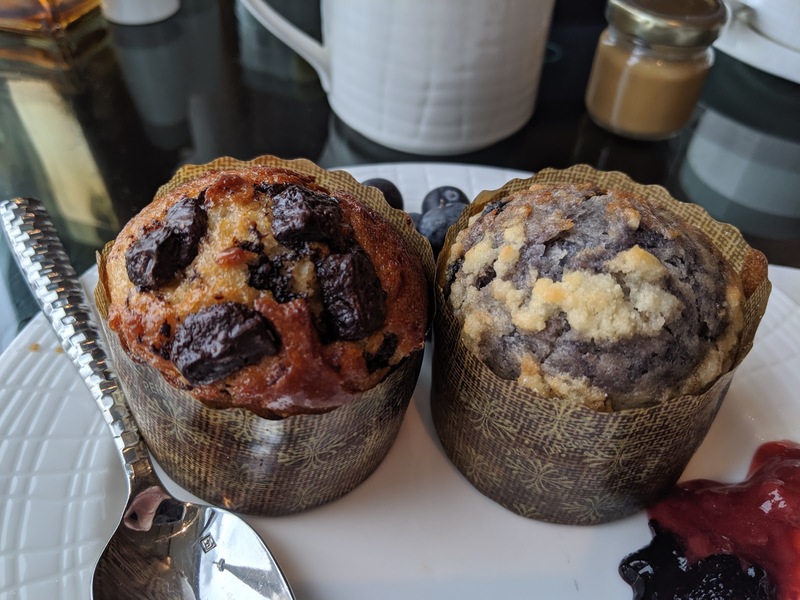 Chocolate Chunk Muffin, Blueberry Streusel Muffin. 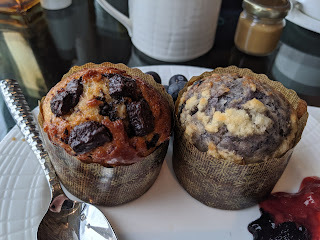 The first morning, I grabbed two muffins, one clearly studded with chocolate chunks (I was craving chocolate), and one that had a color that indicated it might be blueberry (it was). I had zero expectations for these muffins, but I was blown away. Both muffins had crispy tops. I really love crispy top muffins. Check! They were not dry, not stale, not too sweet, not cake-like, just reasonably moist, fresh tasting, good texture. Check! The chocolate chunk one was loaded with really sizable chunks of decent quality chocolate, and I quite enjoyed the chocolate and even the fairly plain base. I quickly finished it alongside my coffee. The blueberry streusel was also quite good, again very moist, with decent blueberry flavor, and interesting texture from the streusel on top. Again not too sweet, not a fake taste like Costco muffins ... even though I do love those for what they are. 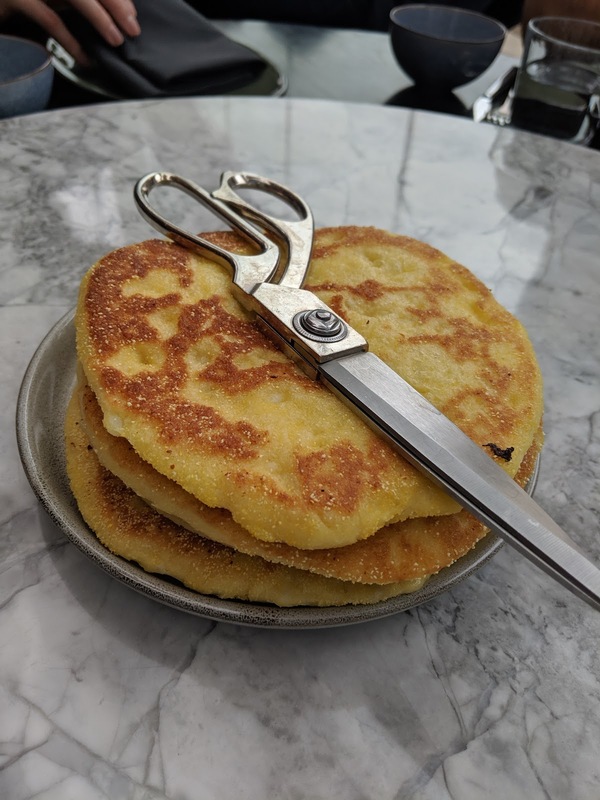 Even better with some butter on it, or dunked into sugar (this is something I grew up doing, with blueberry or corn muffins, and I have no idea why, as I've never sen people outside my family do this). 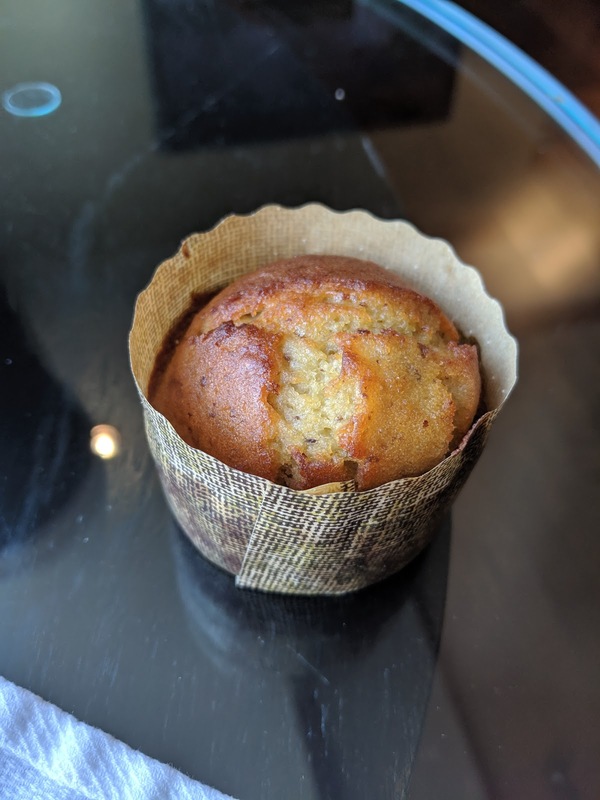 At lunch that day, they still have muffins left, so I grabbed a bran muffin, which seemed like a nice hearty compliment to a light salad based lunch. Like the others, it was fabulous. Amazingly crispy top, which even though it looks a little burnt certainly wasn't, and moist interior. 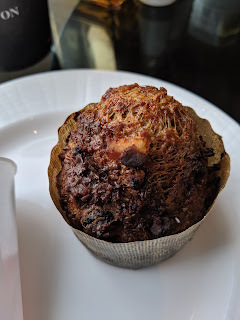 Very hearty style, a bran muffin after all, with a few raisins (juicy, plump, and not so many of them that I minded), and I think some carrot? Great texture, slightly sweet, and not too unhealthy tasting. Even better with a little blueberry compote, and I'm sure standard fruit jam would work well too. 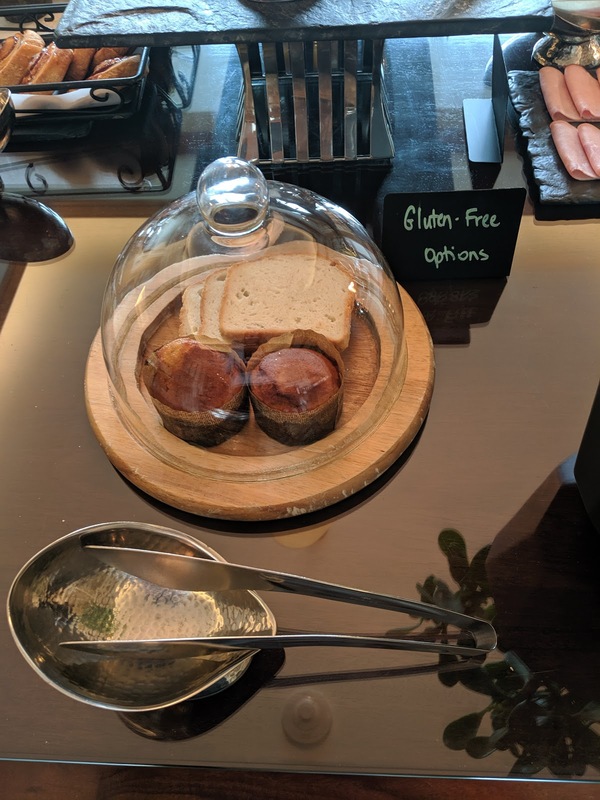 Gluten-free diners are accommodated for with plain sliced bread and muffins, under a glass dome, with dedicated serving tongs. My final morning, after trying all the other muffins (they didn't change, same three awesome muffins daily), I decided to give the gluten-free one a try. It looked like a corn muffin, always a favorite of mine. It turned out not to be corn, but lemon instead. Which, if you read my blog regularly, you know I don't care for (at least in my desserts and baked goods). So clearly, what positive am I going to say about a gluten-free lemon muffin? Um ... I loved it too? It had a strange moisture to it, the texture was really odd, but I enjoyed it. It had a hearty style too, almost like it had whole grains or something, but, balanced by the lemon. Yeah, an odd muffin, yeah gluten-free and strange, but it really worked for me. I liked the lemon flavor even. I don't understand. Even better with butter, and, uh, yeah, dunked in sugar. I was shocked by how much I loved this. 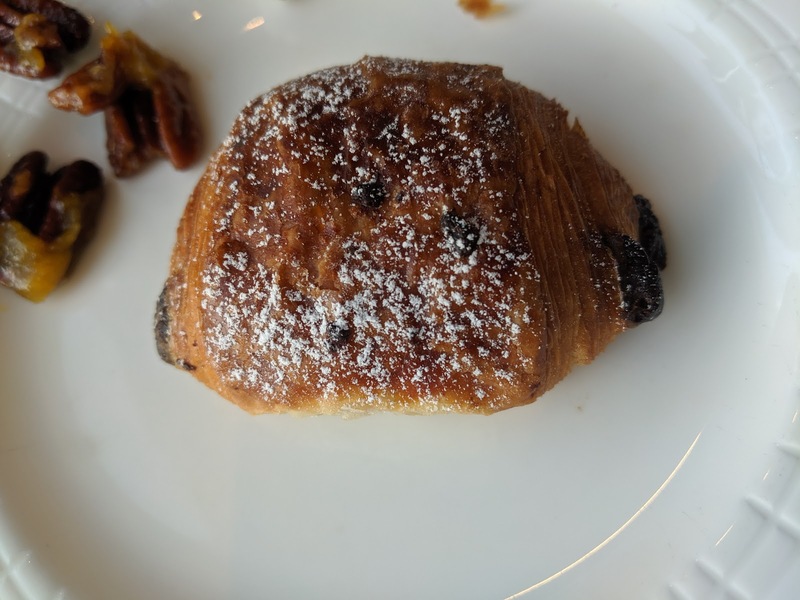 I tried the chocolate croissant the second day, after the success of the muffins, but it was just a generic hotel quality croissant. Decently crispy, mediocre dark chocolate inside, but nothing particularly special, not buttery. The hot food lineup included two proteins, sausage and bacon, the same both days. I tried the bacon, and it was quite good, crispy but not dried out. 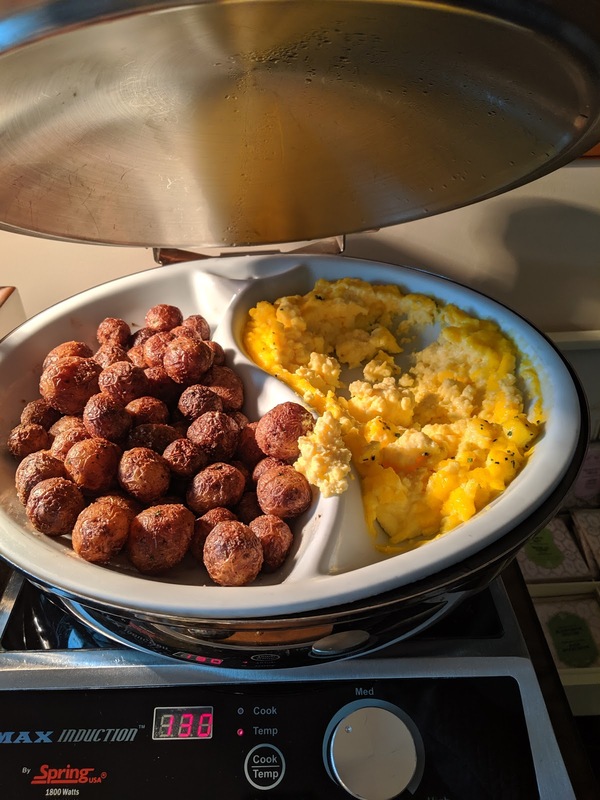 The only other hot offerings were roasted small potatoes and very dried out scrambled eggs. I avoided both. On weekends, in the real lounge, they have an egg chef preparing eggs to order, but, alas, not available in the temporary space. 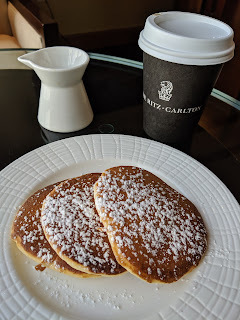 Pancakes (and oatmeal) are available by request only, and I asked about them. I was told, "yes, we have pancakes, we can bring to your table." I asked for one, but got a platter of three. The pancakes came sprinkled with powdered sugar, with a pot of maple syrup on the side. The pancakes were ... um ... lukewarm. Not light and fluffy. Clearly premade and sitting in a warmer. They weren't bad exactly, but they certainly weren't good, and had no real flavor, no buttermilk tang or anything. I added berries, candied nuts, and plenty of butter (and syrup), and they were better, but not being warm nor fresh really limited ow good I could make them. Also, um, no whipped cream! Kudos for offering pancakes though, and again, I wonder if this is just different in the temporary space? And yes, real maple syrup, no question. 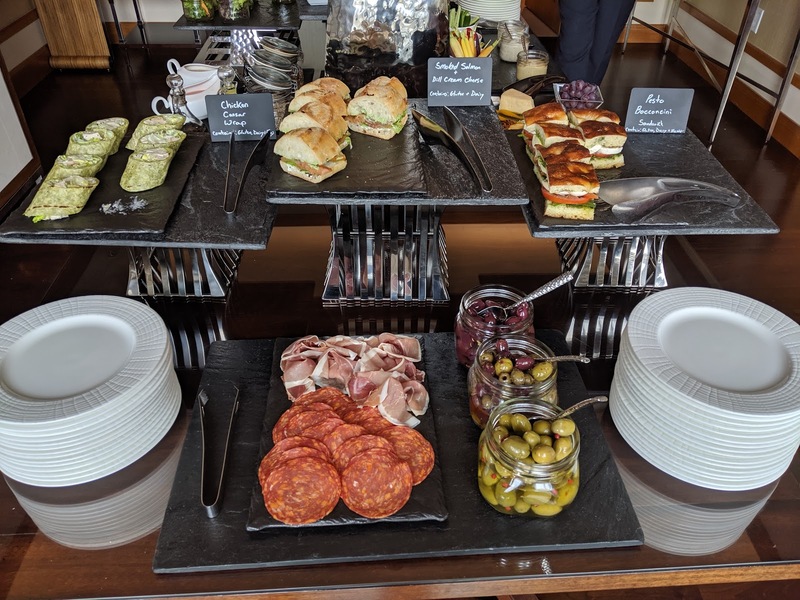 The lunch lineup is a very light offering, with sandwiches, a single soup, 2 small plated pre-made salads, plain mixed greens, charcuterie, nuts, cheese, chips, and bread. Nothing particularly exciting, but the first time I've ever seen a lunch offering in a lounge. I visited two times, and the sandwich lineup seems to follow the same format daily: one wrap, one foccacia, one roll or baguette. One veggie, one seafood, one white meat. 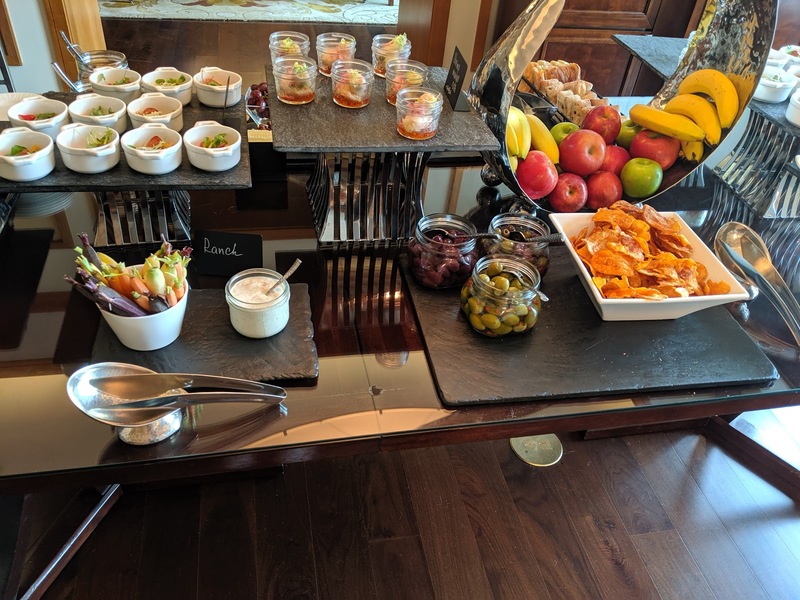 I had no idea what to expect the first day I visited during lunch, since no other lounge I've been in has offered lunch. The sandwich lineup the first day had nothing to offer me: a Chicken Ceasar Wrap, Smoked Salmon with Dill Cream Cheese on Baguette, and Pesto Bocconcini on Foccaccia, as I dislike chicken, didn't really care for the smoked salmon at breakfast, and avoid pesto (pine nut syndrome! ), so I didn't try any. I also didn't try the olives, three kinds, which also were available during afternoon snack time, and in the evening. The charcuterie selection featured pepperoni, huge slices, so I eagerly snatched one of those up, but it was ... just pepperoni. The salad offering came in little tiny mason jars, just simple mixed greens and a shred of colorful carrot in each. This was cute plating, but rather impractical, and I had to dump it out onto my plate to eat it anyway. Also, the jars were too small to contain more than 1-2 forkfuls, so I felt a bit silly as my jars added up quickly. Maple Walnut Dressing / Blood Orange Dressing / Oil & Vinegar / Seeds. I brought my own dressing (left over from my poke bowl from Rolltation a few days prior, too good to throw out! ), and my own mix-ins (left over from Kid Lee a few days prior - review coming soon! ), so I didn't try any of the dressings or seeds. 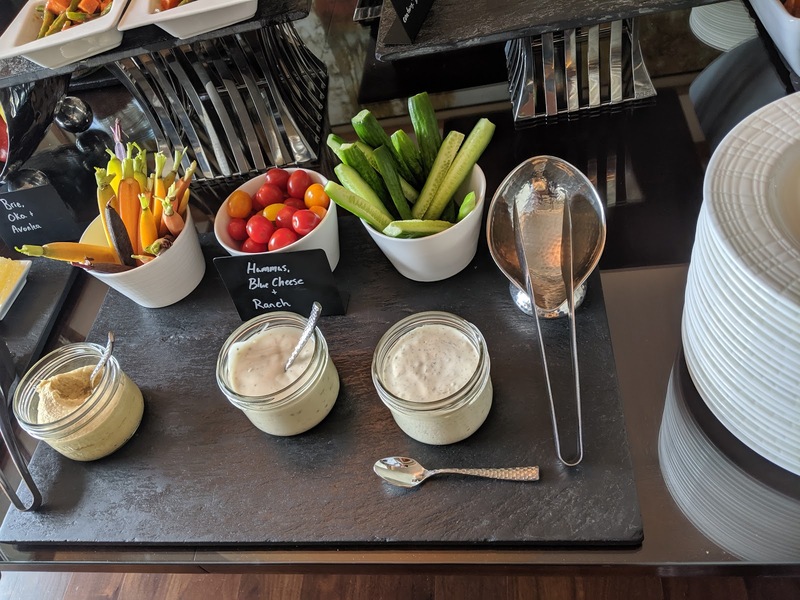 Next came veggies (baby carrots, grape tomatoes, cucumbers), and dips (hummus, ranch, blue cheese dressing). I added some colorful baby carrot sticks to my salad as well, and tried the tomatoes (just standard grape tomatoes, not in season), and tried the ranch and blue cheese, but I preferred my own dressings. 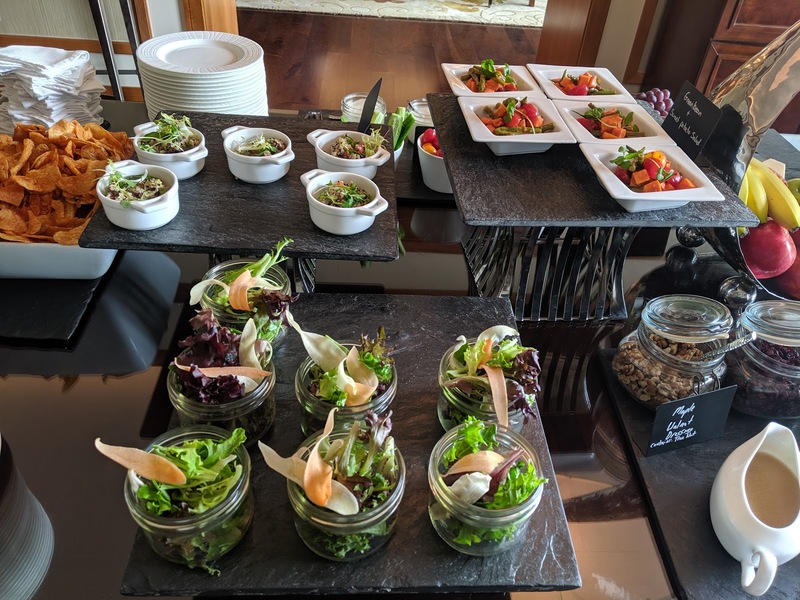 The selection is rounded out by two composed salads (Green bean & Sweet potato or Quinoa), neither of which I wanted, and garlic and smoked paprika chips which were fine, crispy kettle style, but I didn't particularly taste garlic nor paprika, although they certainly were orange. The sandwich lineup the next day was considerably better, and I immediately changed my plans of just stopping by to grab a drink and a few nuts before heading out to a real lunch. I still did not try the composed mini salads though, one was a greek salad, and I forget the other. Sandwiches: Shrimp, Egg Salad, Turkey. 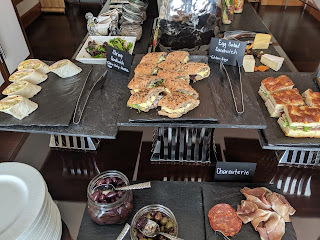 I didn't try the turkey sandwich on foccacia, but it looked like it had a bunch of other things in it, some great spreads perhaps. I had a bite of the egg salad that fell out of my companion's sandwich, and it was ... egg salad. I didn't care for the hearty hard bread either. But, I ... loved the shrimp wrap. More than any other sandwich in recent memory, really. I was confused and surprised. The wrap was grilled, with grill marks on the outside, which was actually kinda nice. I found myself eating the wrap, which I expected to discard. The grill flavor was found throughout, in a way that I just adored. The shrimp and even the lettuce seemed to have been grilled, with such an incredible smoky quality to it all. The shrimp were well cooked, not rubbery, although one of mine was not deveined. The shrimp and lettuce was, uh, very very generously dressed (ok, way over-dressed, but I liked it), with a mayo based sauce, so creamy, and I think must have had some kind of grill like seasoning to it. The smoky grilled lettuce was odd, for sure, soggy and soft, but not in a bad way. So hard to describe. But I really did love it. I eagerly took a second one. 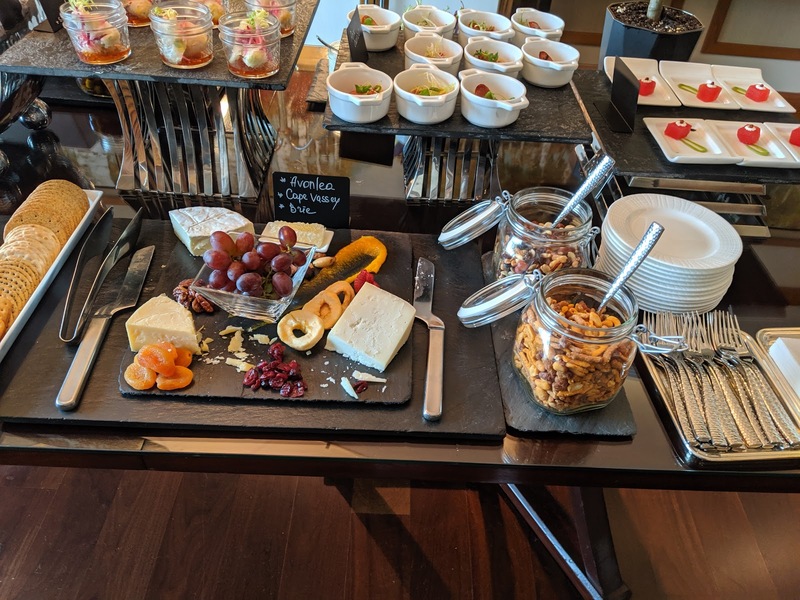 I was fairly amazed at how mediocre the offerings were, only slightly better than any other domestic lounge, and certainly average for an international lounge. The weakest of the meal periods, by far. The drinks weren't particularly extensive, simple canned soft drinks, a couple red and white wines (all screw top, and the whites weren't chilled ....), and basic liquor. You could help yourself, or ask staff to make drinks, they didn't seem to care either way, and encouraged me to just help myself. I appreciated the relaxed service. That said, when I asked about the wine, "Is there a red that is less tannic?" and "Are the whites both dry? ", none of the staff knew, they all just said "they taste like wine to us ..."
The evening buffet is self-serve, with three pre-plated cold items in the center, a cheese board on one side, and veggies and dip, pre-made salad, chips and olives on the other. Two hot items were on the side. I appreciate that everything was labelled, as I'm allergic to several things, including ... the watermelon front and center! The front item here is the "Watermelon Feta with Balsamic", which looked like it had avocado puree too? Another thing I'm allergic to! I mentioned my allergy and was assured that the kitchen works hard to not cross contaminate. I tried the other two plated dishes, and was not pleased. The pork chorizo was fine, a slice of mediocre pork chorizo, good for some protein. But it was served on top of what I think was a fennel slaw, that was way, way, way, way overdressed with some kind of mustard dressing. Just, drenched. However, the teardrop tomatoes on top were actually fabulous, quite flavorful. I was excited to see a seafood option, even if shrimp, and something light, rice paper rolls. However, these were not good. The filling was mostly mushy vermicelli, with way too much mango, making them cloying sweet, particularly given that the bottom of the cup was very low end overly sugary sweet chili sauce, and this whole thing was just a big mushy sweet mess. Pepper, Fennel, w/ Basil Vinegar. 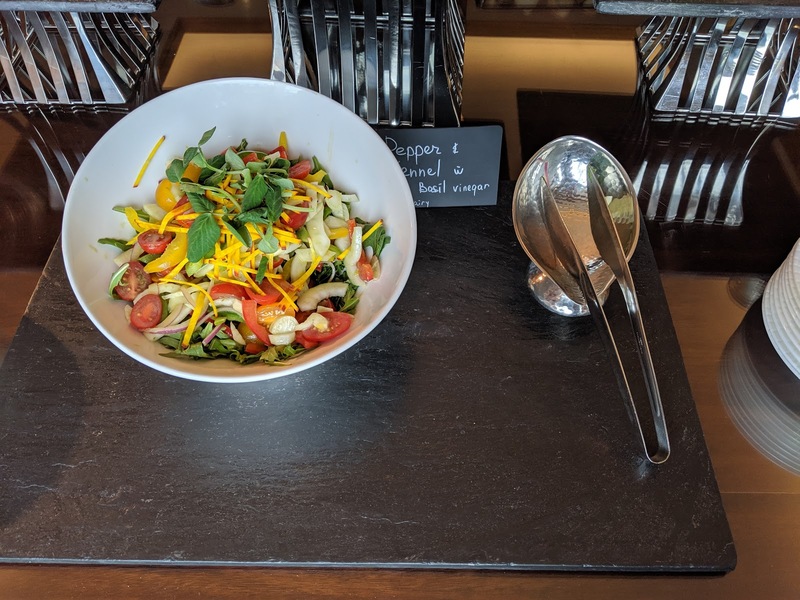 The single salad was a composed salad, with a slew of ingredients, but featuring lots of slices of bell peppers. The tomatoes were just standard cherry tomatoes, not as glorious as the teardrops, but I liked the fresh herbs on top, the shredded yellow beats, and the flavor from the fennel. I didn't care for the large quantity of bell peppers, just never my veggie of choice, and I wished it didn't have the vinaigrette on it. 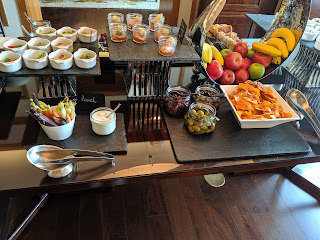 Back side of buffet: chips, olives, veggies. The back side of the buffet wasn't exciting to me, just baby carrots with ranch, 3 kinds of olives, and the same chips from lunch. I skipped everything from here. Cheese Platter / Snack Mixes. 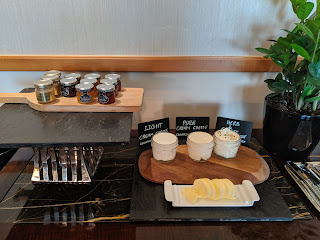 The cheese lineup was fairly mediocre, featuring avonlea (a mild cheddar), cape vessey (gah! goat cheese! ), and brie (not particularly ripe). I tried them all, but none were notable. The platter also had simple dried fruit (apples, cranberries, apricots), grapes, honey, and what turned out to be marvelous glazed nuts. On the side was an assortment of standard crackers, and jars of mixed nuts and snack mix. 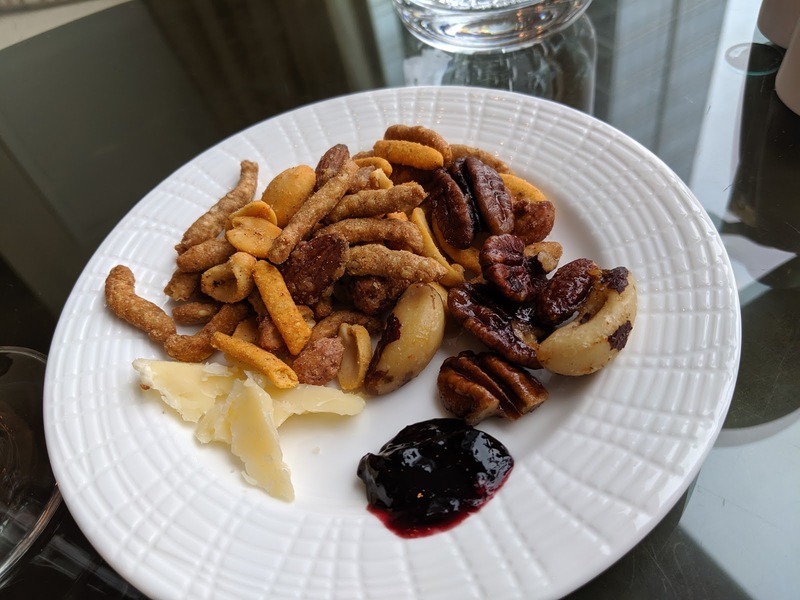 Glazed Nuts, Compote, Avonlea, Snack Mix. The glazed nuts I really loved, and may have taken nearly all of them. I particularly liked the pecans and brazil nuts, but all had great sweet coating, and some spicing. They had them at lunch the next day as well, and I took them all then too. Definitely star of the night. 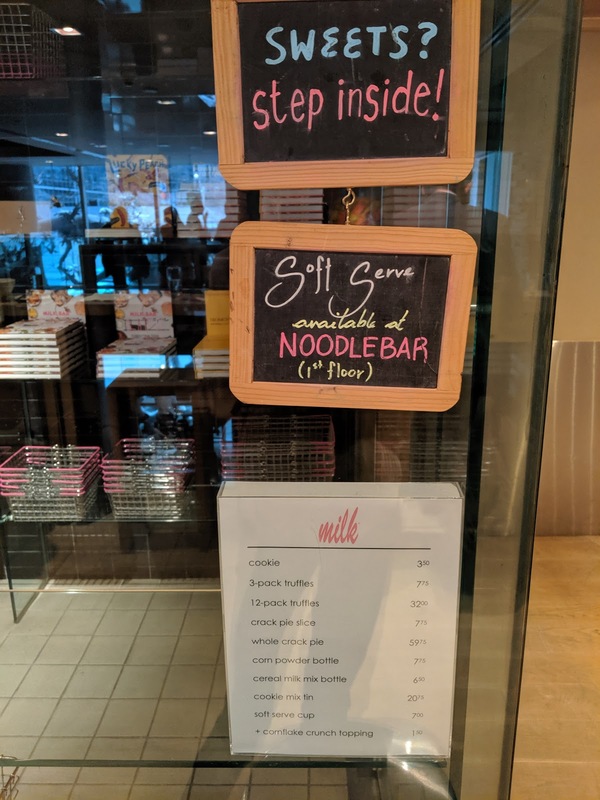 The snack mix was a bartender's blend mix (e.g. the kind with sesame twigs, cheesy corn sticks, candied peanuts, etc), and I eagerly took a generous serving, as I tend to love this kind of stuff. However, this one didn't have any real winning components, and even the candied nuts in it paled in comparison to the glazed nuts from the cheese board. Shrimp Spring Rolls with Plum Sauce. The "hot" items were under heat lamps, which ... didn't do their job very well. I wonder if in the real lounge they have better heating elements? 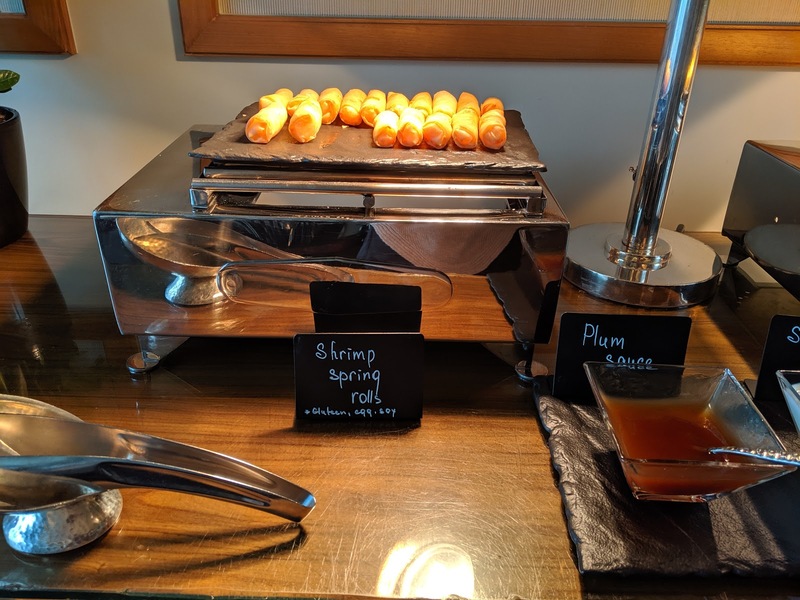 The spring rolls were decently crispy, and actually contained a really generous amount of shrimp, but they weren't hot, barely warm, and the plum sauce, much like the sweet chili with the fresh rolls, was cloyingly sweet. I did not bother trying the spanokopita, but I found it odd that they came with sour cream on the side, not a combination I've seen before. And finally, at 8pm, the savory food is cleared away, and ... dessert is brought out. I was so excited for this, as I love desserts, and it was described as a whole room of dessert! I also moved on to port at this time, trying both offerings. Both were fine, perfect to pair with the desserts, but not particularly notable. The desserts made me happy. I actually really enjoyed my selections, but, it was not nearly as extensive as I was expecting. Maybe when its in the real lounge it is more generous? 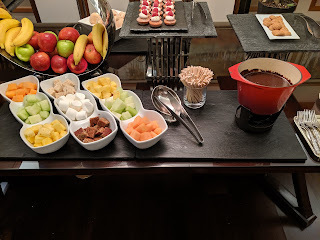 The dessert buffet basically had one of every category: one mini cake, one pudding, one cookie, plus a fondue station, chunks of excellent dark chocolate, and mini biscotti. The chocolate and biscotti I recognized as they were part of my welcome amenity, and both were quite good. I particularly impressed with the quality of the dark chocolate. Side note: Why is the biscotti not offered in the afternoon alongside coffee and tea? Or even with breakfast? It was nice to have for an evening thing, but I'd gladly have it with my coffee earlier in the day. Same with the chocolate. It was a cute setup, but the not very fresh nor ripe looking fruit (melons, pineapple), and the generic marshmallows and chunks of rice crispy treat weren't particularly inspired. Still, I skewered a marshmallow, dunked it in mediocre chocolate, and tried to enjoy. 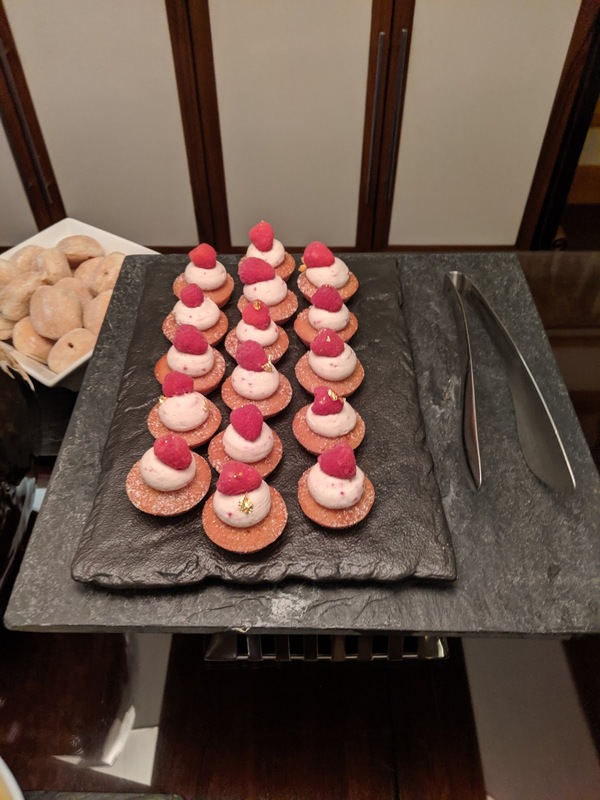 The single cake-like offering, dense, not fresh tasting, little cakes, with a decent enough raspberry cream on top, and a raspberry. At least I liked the cream. The cookie offering (in addition to the regular cookies that are out all day), little amaretto cookies. I skipped. I knew these immediately. I first had them in Lisbon I think, and adored them, and enjoy them regularly in Sydney at the Sheraton Grand Hyde Park. They aren't fresh baked, ship frozen, are mass produced, but ... I love them. 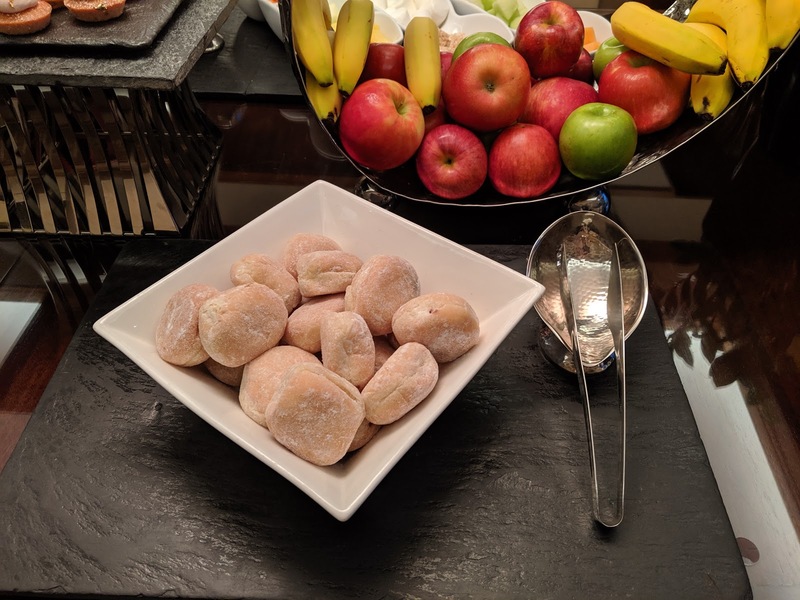 They aren't fresh, and the outer shell kinda peals off in this strange way, but I love it, particularly all the powdered sugar on the exterior. They are soft and fluffy, and generally filled with interesting things (chocolate pudding, jelly, etc). These were all chocolate pudding filled, not bars of hard chocolate like morning croissants, but actual pudding. 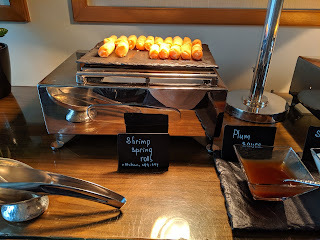 I loved them, and honestly, devoured multiple in 1-2 bites each. Side note: why not offer these at breakfast, or afternoon time? I mean, I loved them, but donuts not coming out until 8pm is a sad thing! The verdict? Wow, I was pleasantly surprised. It was really quite excellent panna cotta. Creamy, thick, rich base, loaded with vanilla bean. Perfect texture, firm but not jelly-like. Great flavor from the vanilla bean. 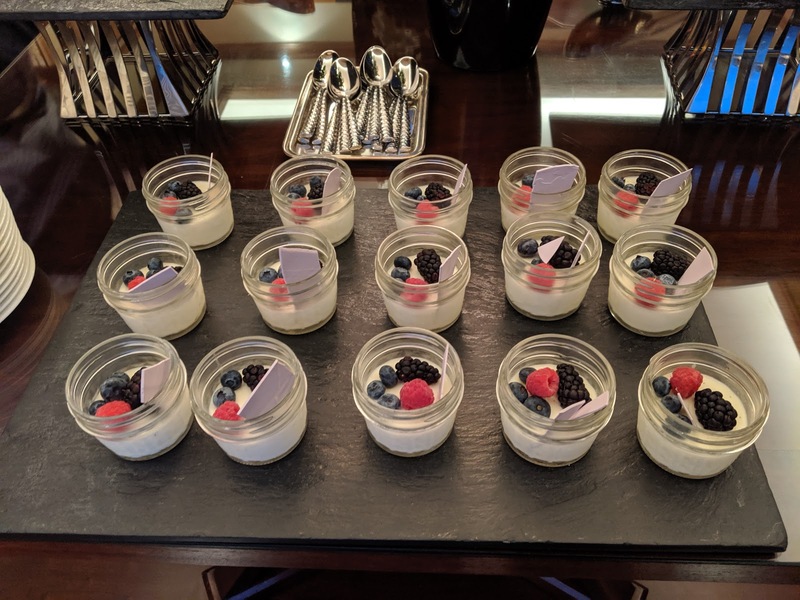 Honestly, textbook quality panna cotta. 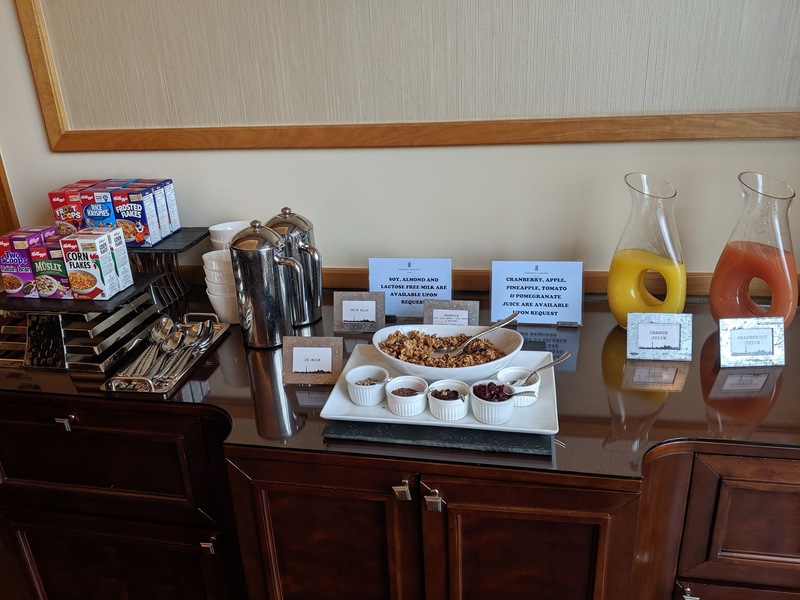 The fruit on top (blueberries, raspberry, blackberry) were all fresh and delicious, and seemed higher quality than the same berries served at breakfast. And of course I adore the white chocolate shard on top. I really truly enjoyed this, and added the raspberry cream from the little cake to it, and was beyond pleased. I wanted a second one, but it really was a full size item, and, uh, those 2 donut holes were starting to kick in too. I wished I was there a second night to get another!